It has been over ten years since Android was first outed by Google, and back then it was hard to imagine the sheer number of apps we'd have today. Admittedly, the huge quantity of apps doesn't mean they're all quality - far from it in fact, and finding the good ones can be tough. What's the best phone of 2019? There are tools and techniques to help, with various lists in the Play Store providing you with Editor's Picks across a range of categories, new releases and even apps that are specifically recommended for you based on your previous installs. So to make sure you never install a duff app here's our selection of the best you should install right now - each one carefully chosen to ensure you'll have a whole suite of fun, engaging and, dammit, useful apps on your phone or tablet. We've sorted them into categories so you can more easily find what you're looking for. But make sure to check back weekly for our free Android apps of the week, which you'll find below. Each week we add two apps to this list and you'll find these two latest additions below. 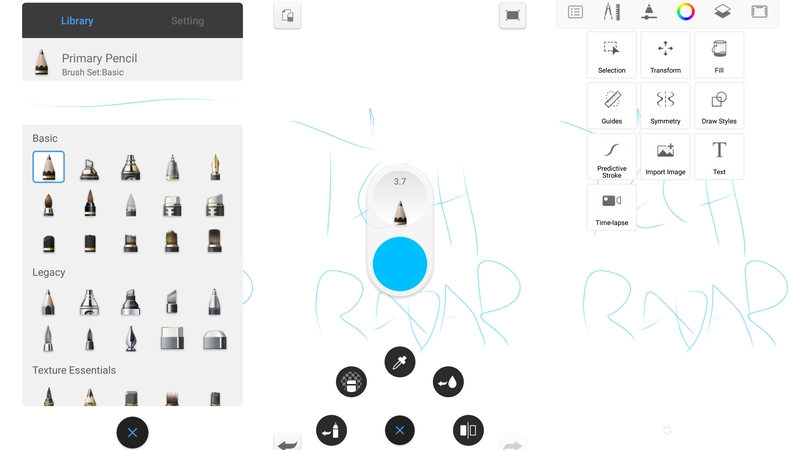 Our favorite free Android apps for painting, drawing, sketching, design and animation. 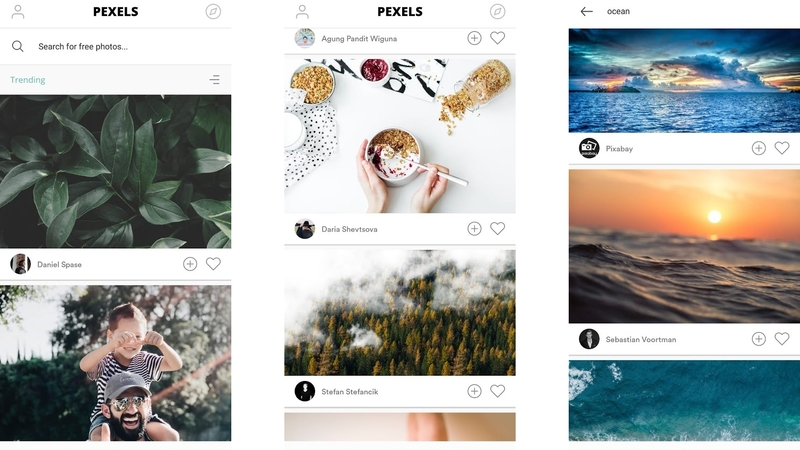 Over could be the app to take your social media game to the next level, as it has all the tools you need to create stylish designs full of photos, images and text, fit for Instagram, Facebook and most other social sites or even for use on posters and flyers. 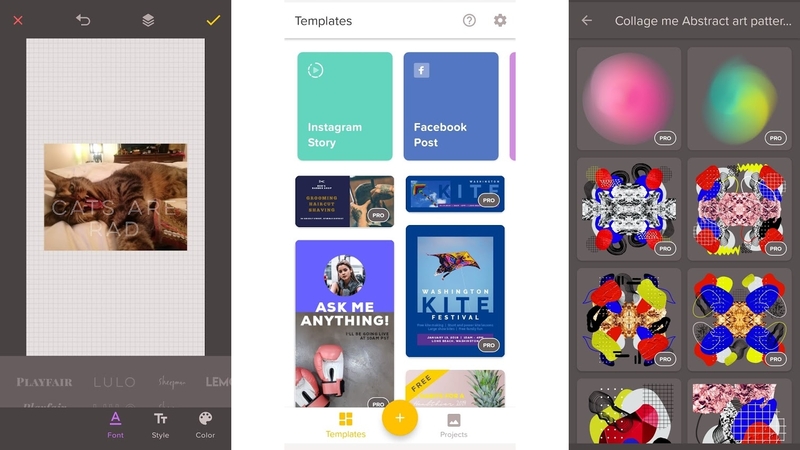 The app lets you select from a range of canvas sizes, many of which exactly line up with the sizes used by popular social sites, then lets you add images and text to them, with various options available, including a range of fonts, the ability to adjust colors and positioning, and more. Over also includes plenty of pre-made graphics to spice up your projects, and when you’re done creating you can easily share your design to other apps or save it as a JPG or PNG. The basic tools are mostly free, but power users might want to pay for the Pro subscription, as this gives you access to more of everything: more fonts, more graphics, plus a database of templates, so you don’t have to build up your designs from scratch. Redecorating or improving your home can be a daunting prospect, but Houzz could make it a little bit more manageable. It could do that by inspiring you through its library of millions of photos, showing exteriors and interiors of various styles. It could also do that by giving you a single storefront to find and buy all the furniture and other items you need, even going so far as to let you see products in your home, using augmented reality. And it can do that by helping you find experts – such as architects and builders – to do the hard work for you. 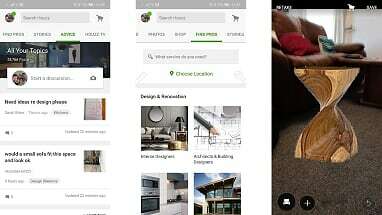 If you’re planning to take on the task yourself then there are also plenty of articles on hand to help, as well as the ability to ask the Houzz community for advice. If you use WhatsApp, you’re probably aware that the service has finally added support for stickers, so as well as emojis and GIFs you can now send larger emoji-like images. But while there are plenty of sticker packs to choose from there’s also – thanks to Sticker Maker – the option to make your own. 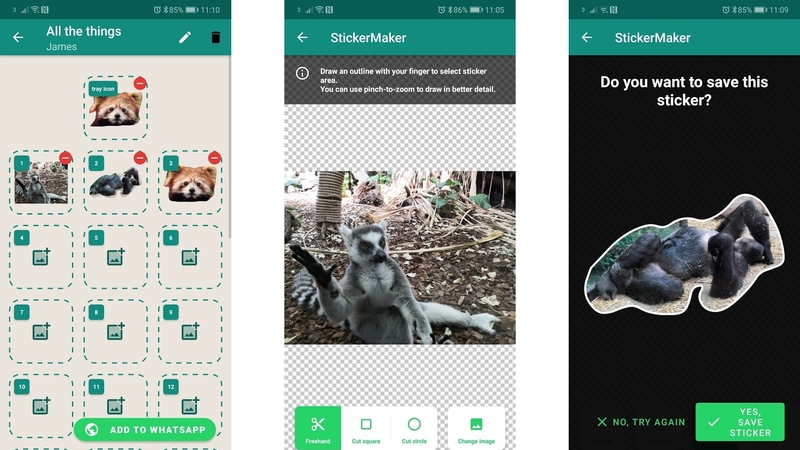 The app first has you create a new ‘sticker pack’ which you can name, then simply load up an image on your phone and cut out the part of the image that you want to use as a sticker. You can do this freehand or use tools in the app to cut a perfect square or circle. You can also rotate the image if you want and then save it to your pack when you’re happy. Packs can contain up to 30 stickers, but need at least three. Once you’ve made at least three you’ll be able to send the pack to WhatsApp, where you can use your custom stickers just like any others. If you later want to add or remove stickers from the pack, you can do that. You can also make additional packs if you have more than 30 sticker ideas or just want to keep the packs themed. Sticker Maker is a slick app, and a useful one for anyone who likes WhatsApp stickers but just wishes they were more personalized. Pexels is a database of photos that you can use for free for any purpose, including commercial uses, with no attribution needed (though it notes that attributions are still appreciated). You can search using keywords or browse trending images, while tapping the photographer behind a photo will show you their other work on Pexels and let you follow them, so you never miss anything new that they upload. You can also ‘like’ and collect photos within Pexels and if you want to take them outside the app you can easily share them with Instagram or other apps, save them as your wallpaper, or simply download them. But Pexels also lets you become one of the photographers, as you can upload any of your own photos to the app for other people to use. However you choose to use Pexels though, it’s a slick, beautiful app. SketchBook isn’t a new app, but while many of the features used to cost money, it’s now completely free, making it worth revisiting. The features that are now free include more than 130 brush presets, customizable canvas sizes, various rulers, high quality image imports and more. And that’s on top of all the basic tools that were already free, such as a layer editor and pen mode, all of which combine to make this one of the most generous free sketching apps available on Android. Coming from Autodesk, the power of SketchBook should come as no surprise, but it’s an app that seemed worth the money previously and is now utterly essential if you’ve even toyed with the idea of digital sketching. 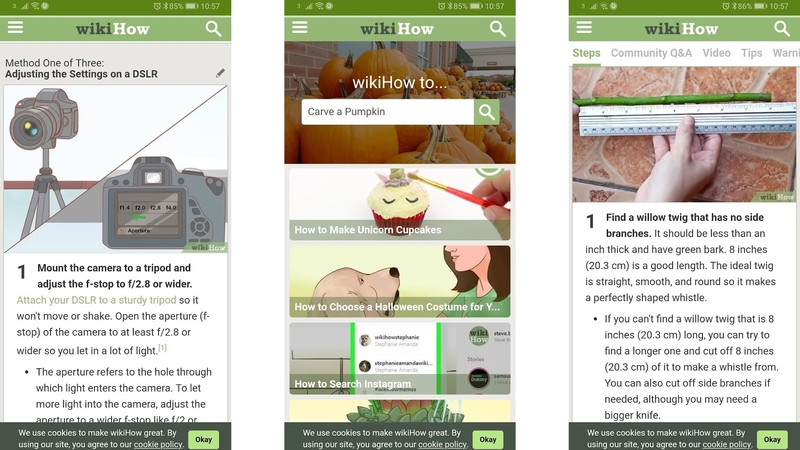 WikiDIY is a website that’s packed full of DIY projects, with guides for everything from making unicorn cupcakes to making a willow whistle. But it’s not all about making things, as WikiDIY also has guides for things like how to clean rubber on shoes or how to take good photos at night. All of these guides can now be found in its new DIY Projects app, and they come with step by step instructions, diagrams, and in some cases videos. The guides also have questions and answers supplied by readers, along with lists of what you’ll need and any warnings that it’s worth being aware of before you start. You can search for specific guides, browse by category, and bookmark your favorites. And while the app itself isn’t the best we’ve seen (it often feels like little more than a web wrapper) it’s hard to argue with the quality and quantity of the content. Ever wanted your own custom emoji and stickers that star you, rather than a generic face? Then you should definitely download Bitmoji. This lets you recreate your likeness in cartoon form, with loads of tools available to make the look as perfect as possible. Then you can choose an outfit and get access to dozens if not hundreds of stickers, each of which feature you. These can be shared to various chat and social apps, but Bitmoji has deeper integration with Gboard, letting you share its stickers direct from the keyboard. It can also be linked to your Snapchat account, making your Bitmoji your Snapchat avatar. 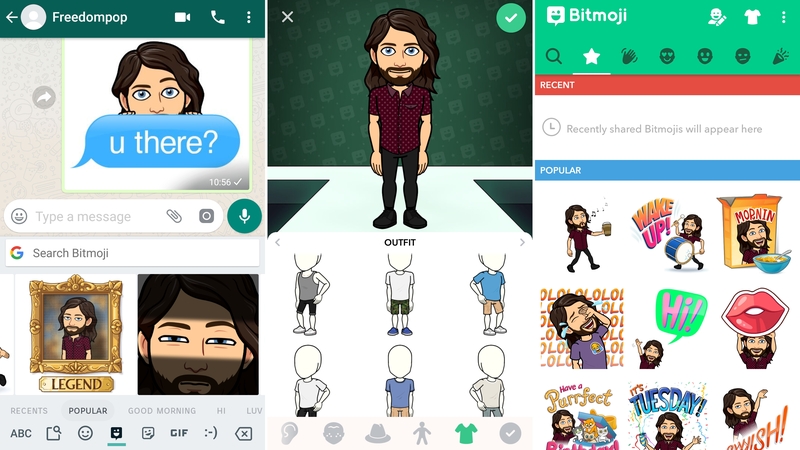 You can alter the look of your Bitmoji at any time, so if you change your own hairstyle you can change theirs to match, or just give them a new outfit, and new stickers and customization options are being added over time, so you shouldn’t get bored. 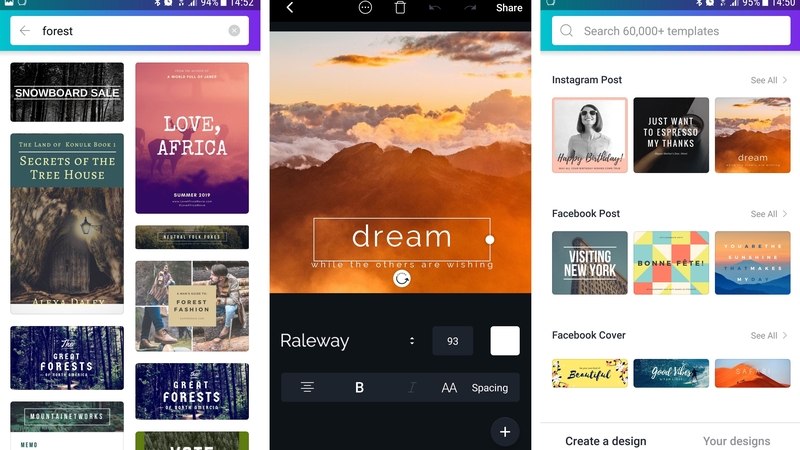 Canva was a hit on iOS and now it’s arrived on Android, giving you a simple yet powerful way to create posters, collages, flyers, cards, Instagram posts, banners and headers for blogs or other social media, and more. It’s a graphic design app, and one that’s intuitive from the moment you launch it. Start by choosing the type of content you want to design, then take your pick from a wide selection of ready-made templates (or search for something specific). Once that’s done, you’re ready to get editing. You can tap on any part of a template to change it with context-sensitive tools. Tap on text, for example, and you can write something new, or change the font, size, color and spacing. Select an image to change the color, add a filter, adjust the brightness, contrast, saturation, or switch it for a different picture altogether – either one of the many in Canva or one from your gallery. You can also drag and rotate things, and there’s unlimited undo, so you can go back as many steps as you want if you make a mess of the whole thing. When you’re done, you can save your creation to your phone or share it online. It’s also saved in the ‘Your designs’ section of the app, which you can access from the web and other devices, so you’ll never lose a design you’ve made. Our favorite free Android apps for shooting, sorting and editing photos and videos. 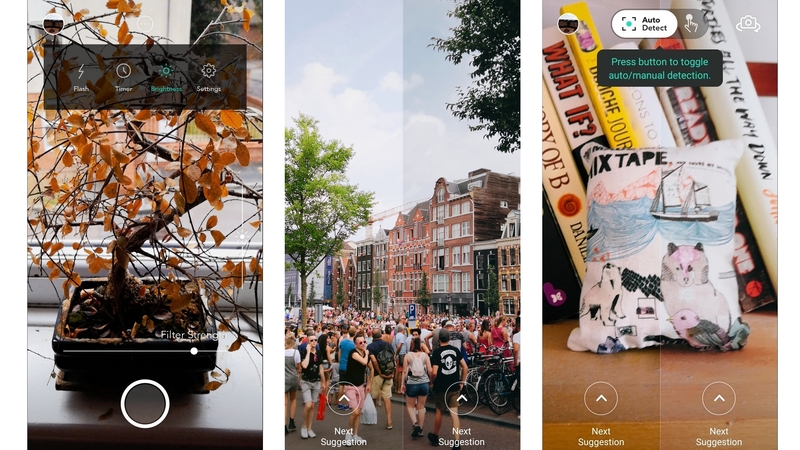 Curator claims to be the first gallery app that organizes your photos using AI entirely offline, giving you the search power of something like Google Photos, without compromising on your privacy. It works well too. 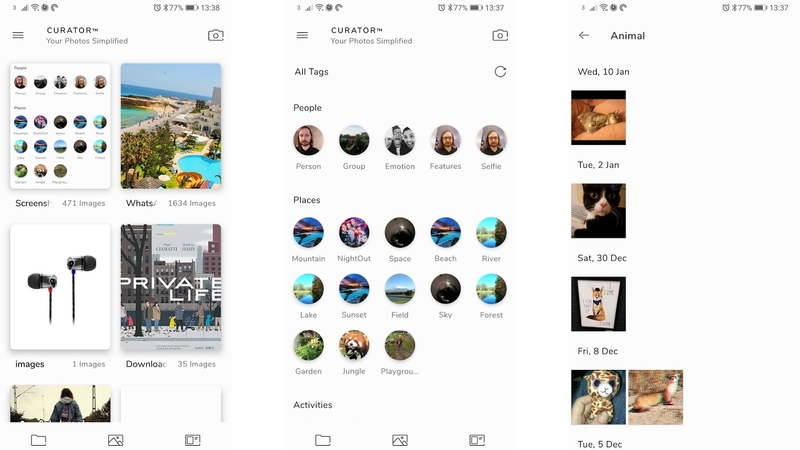 The first time you launch the app it will analyze and assign tags to all of your photos (which can take a long time), then if you search using a keyword, such as ‘beach’ or ‘cat’, it will show you every image containing that. Curator has a nice interface too, with two themes and the ability to view albums, all images, or all of the tags that have been assigned. Albums can be renamed and favorited, photos can be moved between albums and there are gesture controls, to help you navigate the interface faster. There are also new features on the way, such as private folders and shared albums. If you don’t care about the added privacy offered by Curator, then Google Photos is still the better app. Not least because it backs up your images and gives you access to them from other devices, but Curator is a strong alternative for those who prefer to keep their online presence to a minimum. Photo Map is simply a world map that displays your photos over the parts of the world that you took them in. Zoom out and you’ll likely just see a single thumbnail of one of your images over each country that you’ve snapped shots in, but zoom further in and you will see photos grouped into much smaller areas too. The thumbnails also have a number on them, telling you how many photos are in that gallery. You can easily see them all and enlarge them with a tap. There are a few options, such as the ability to change the look of the map or add terrain or satellite imagery to it, but mostly it’s just a great and simple idea – a visual way of separating your photos based on where they were taken. This is definitely one for those who like to travel! Photo Map is free to use, but a one-off $1.49/£1.29 IAP will get rid of adverts. If you love slathering filters all over your photos then there’s a good chance you’ll love Picai, as it makes the process a lot smarter than most apps. But this isn’t just a tool for sticking filters on photos you’ve already taken (though you can do that too). Rather, it’s a camera app. Simply point it at something you want to photograph and it will use AI to detect what you’re looking at, even going so far as to provide a text pop-up telling you what it sees. From there it will automatically choose filters that it thinks would be a good fit and overlay two of them on the viewfinder – one on the left half, the other on the right. That means you can see what a filter will look like before you even take a photo. If you’re happy with one, you can swipe horizontally across it to select it, or you can swipe up or down to cycle through filters. It’s a clever idea, well implemented and completely free. 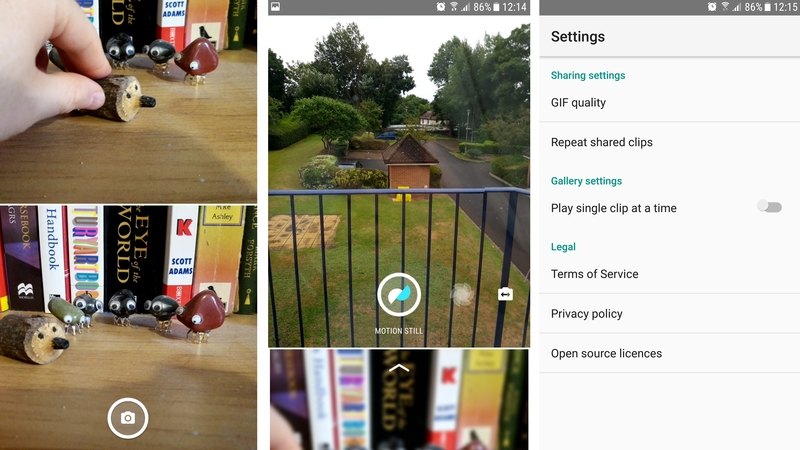 Your phone might already have Google Lens built in, but if not you can now download it from the Play Store, and that’s worth doing. Once you’ve launched the app you can point your camera at almost anything and get information on it. Point it at a book and it will give you links to reviews of the book and places to buy it. 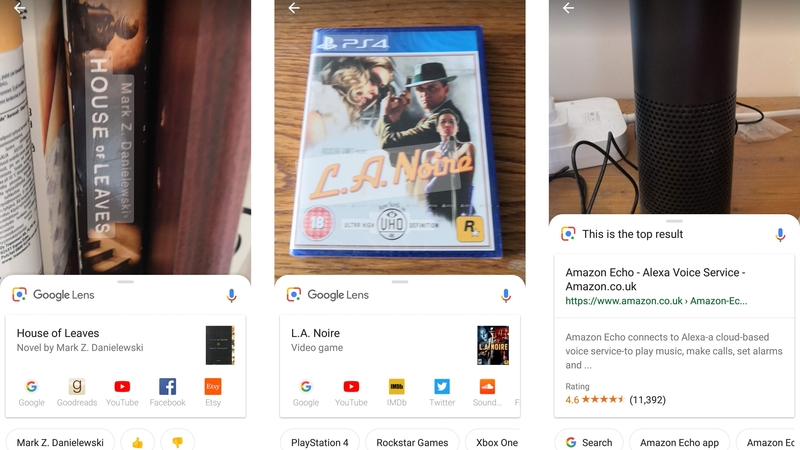 Other products also produce store links, or if Google Lens can’t definitively identify something it will suggest similar products. You can also point it at a landmark to get information on it, at foreign text to translate it or at an event to add it to your calendar. You can even point it at plants or animals to identify them. The results aren’t perfect. In our experience Google Lens will regularly incorrectly identify something or fail to come up with any suggestions for what something might be, especially with more unusual items, but it works often enough to be genuinely useful, especially once you get used to the kinds of things it’s likely to work with – so you know whether to even bother booting it up. PhotoDirector is one of the more powerful and polished photo editing apps available on Android. It’s got you covered for fun filters, frames and effects, but it gives you more control than some of its peers. For example, you can adjust the strength of effects and choose to apply them globally or selectively. You get a lot of control over the core image too, as you can adjust the white balance, saturation, hue, sharpness, tone and more. You can also rotate, crop or mirror the image, cut out sections, adjust the perspective, and if you’ve taken a portrait remove red-eye. There’s more here, too much to list, but suffice it to say, PhotoDirector is a comprehensive app. You’re not limited to just editing photos you’ve already taken either; there’s also a camera component, allowing you to take new shots and see how effects and filters will look before you’ve even taken a picture. PhotoDirector is free to download and use. There’s an optional subscription for £2.59 (around US$3.70) per month if you want to unlock additional tools, remove adverts and improve the output quality, but the core app is already far more generous than most free offerings. Just a Line is a simple example of the creative potential offered by AR (augmented reality). 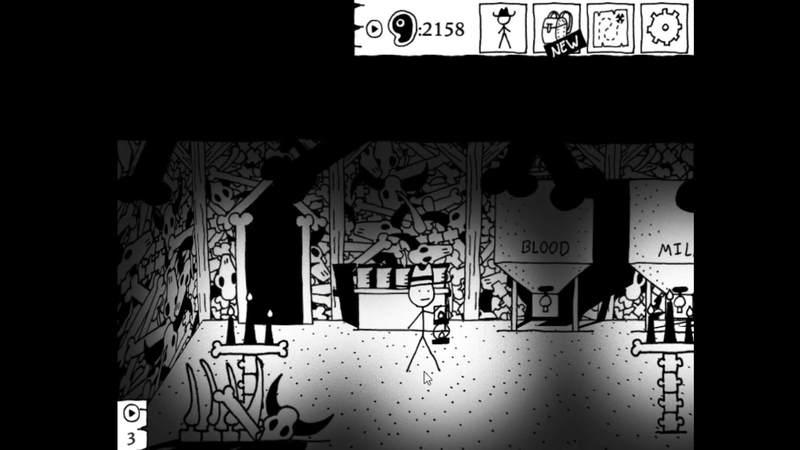 It lets you view the world through your phone camera and draw on scenes by touching the screen. You can see your drawings from multiple angles as you move the phone around, and you can film your creations to save them or share them with others. 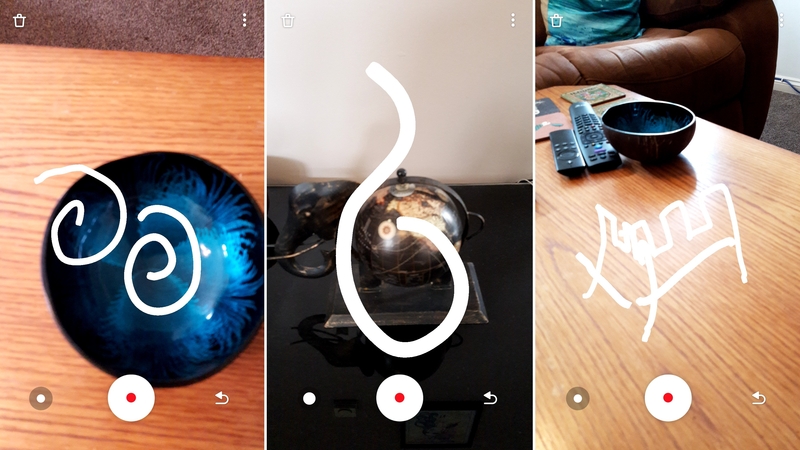 There’s not a whole lot more to it than that, and Google (which built the app) describes Just a Line as an experiment, so you should go in expecting a curiosity rather than a full-featured app, but it’s a fun introduction to AR that can be enjoyed by all ages. 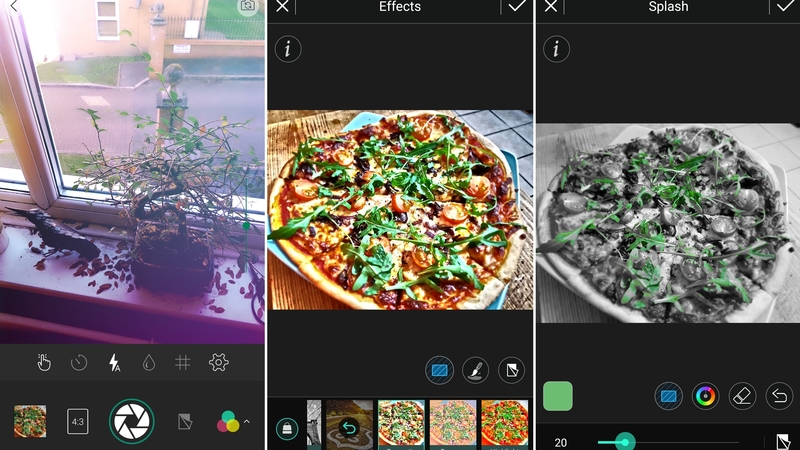 There are loads of filter apps and photo fixers on Android, but LightX Photo Editor is one of a much smaller number of comprehensive editing apps. It has plenty of filters, as well as tools for sharpening images and removing blemishes, and much more besides. 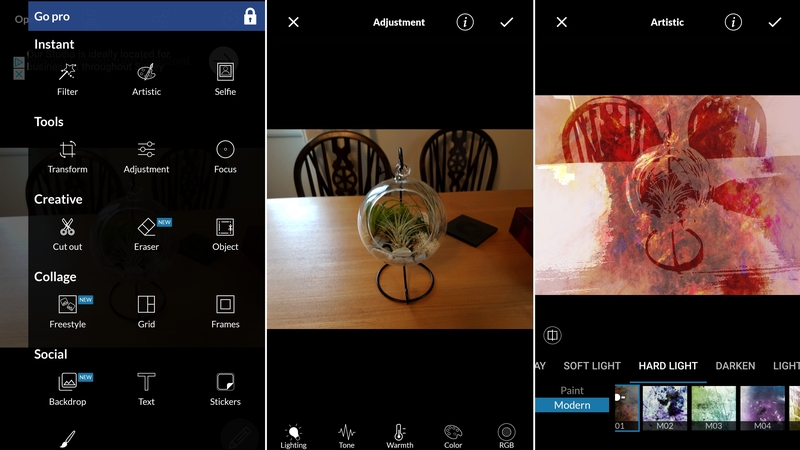 You can tweak the hue, saturation and tone, adjust the focus, add a frame, sticker or text, merge images, create collages, flip, crop and rotate, draw on pictures and change the perspective. All of that is free, though there’s an optional IAP to remove adverts and add a few extra features. Whether you opt for the free or paid version, LightX is a powerful, feature-packed app that should suit most mobile photo-editing needs. It’s not often that Google’s apps come to iOS before Android, but Motion Stills did, as it was designed to stabilize Live Photos, so they’d come out smoother. Now though it’s out on Android too, letting you shoot a short video clip which the app stabilizes. Clips that you shoot can be saved as a video or a looping GIF and then shared on social media, and Motion Stills also lets you use a ‘Fast Forward’ mode, which will condense up to a minute of footage into a shorter clip. This too is stabilized, to keep it smooth, and you can pick the playback speed. Motion Stills only works for new footage – so you can’t import and stabilize anything you’ve already shot (though if you just want to turn old footage into a GIF there are plenty of other apps that will do that). But for anything new you shoot Motion Stills is a great way to make a GIF or short video and ensure footage remains smooth. It’s fast too, as footage is stabilized in real time, so you don’t need to wait for it to process your clip, and it’s completely free. 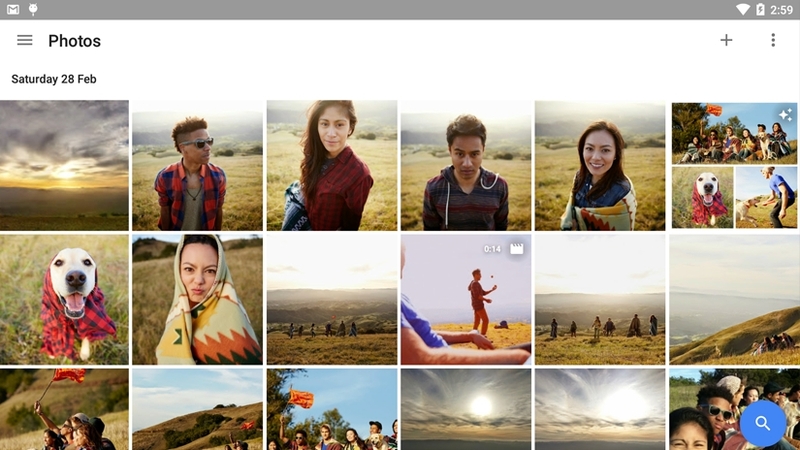 There are probably hundreds of photo apps around, but Google Photos stands out as it gives you unlimited storage for photos and videos, all for free. That's reason enough to jump on board, especially as it works not just on Android but on iOS and computers too. But with basic editing tools and the ability to make collages and albums this is more than just photo and video storage, it aims to be your first and last stop after taking a picture. To achieve that it will need a few more features, but it's well on its way. 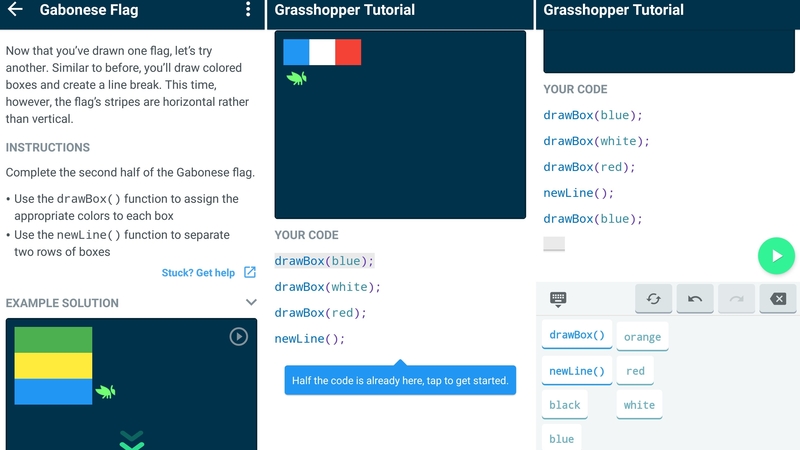 Our favorite free Android apps for learning new things, from history to music to coding and beyond. StudySmarter aims to help you do just that. 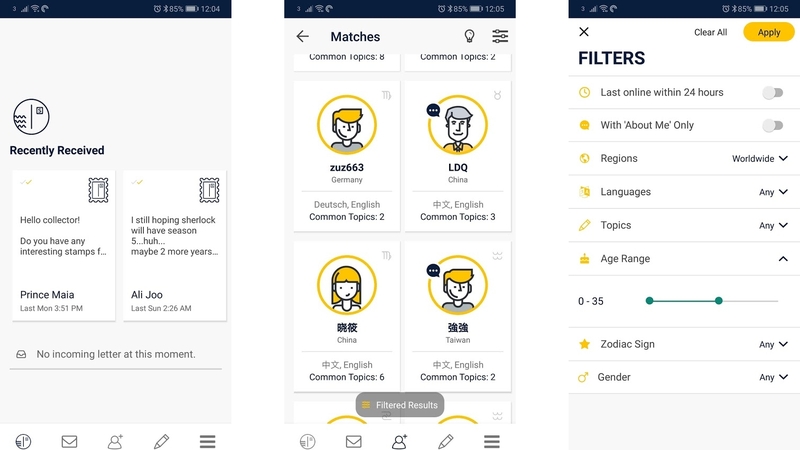 When you first launch the app, you can pick your area of study from numerous categories, such as law and mathematics, then you get access to various flashcards aimed at teaching you the subject. But better yet, you can create your own flashcards and optionally share them with the rest of the StudySmarter community. Speaking of the community, there’s also an area where they can ask and answer questions related to subjects. StudySmarter users can also upload documents related to a subject, ensuring they have access to all their study materials within the app and also giving access to other users, and users can even add their own subjects to the app. The result is an app with a whole lot of potential, because as the user base grows, so will the number of study aids. 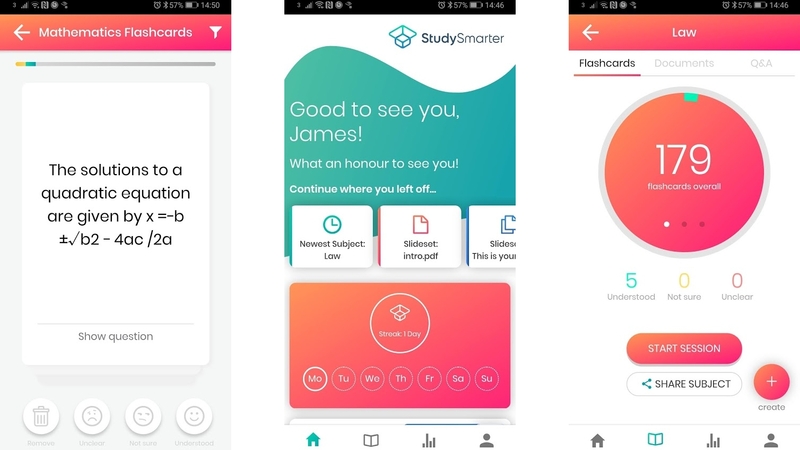 Right now, the content is somewhat limited, meaning it’s most useful just as a way to create and use flashcards, but as a free download that’s enough to recommend it and if enough people take to it then StudySmarter could one day be a very smart way to study. StorySign is designed to help deaf children learn to read, by translating children’s books into sign language. 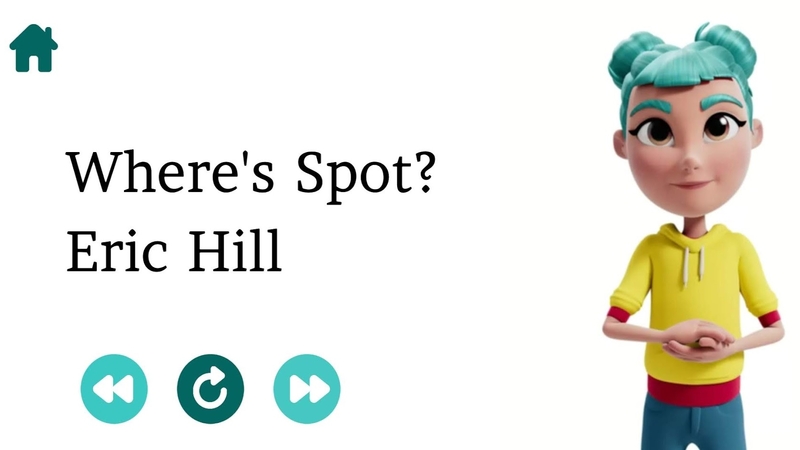 To do this you need not just the app but supported books too, which at the time of writing in the UK is limited to just Where’s Spot?, but more are expected to be added. With book in hand, just point your phone’s camera at the page and an animated character in StorySign will read the page in sign language. And children will know which words are being signed as the word will be highlighted. As such they’ll both be able to enjoy the books unsupervised and learn to read in the process. While the content of StorySign is somewhat limited so far, there’s a lot of talent involved, with Aardman Animations (the company behind Wallace and Gromit) designing it and Huawei AI powering it, while Penguin Random House has partnered with it to supply classic children’s books to the app. Even in its limited form, StorySign is well worth trying if you have a deaf child young enough to appreciate it, but we expect that this is one app that will just keep getting better as its library grows. 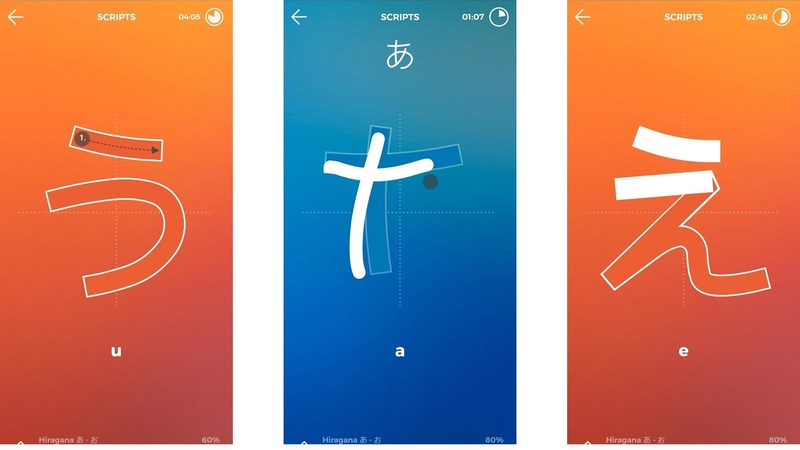 Scripts is a language-learning app focused specifically on learning to write and read in Chinese, Japanese or Korean. These languages are among the trickiest to learn as each one has a unique alphabet, but Scripts gives you a fighting chance. It does this by showing you letters from the language you choose to learn, and then taking you through short exercises which see you swipe across your screen to draw the letter yourself. Initially you’ll be swiping across an outline of the letter, but it quickly moves on to just showing the letter at the top of the screen or not showing it at all, so you really have to learn to progress. You’ll repeat the same letter a lot, but the exercises are all bite-sized, and so is your study, as you can only practice for five minutes each day unless you pay. That’s not necessarily a bad thing, as everyone should be able to fit in five minutes of learning, but if you do want more you can pay $10.99/£10.49 per month, with discounts if you commit to a year. That gives you unlimited time, removes adverts, lets you access Scripts offline and gives you full access to Drops. We’ve covered Drops previously but it too is a language learning app, but it’s broader, rather than just being focused on the alphabet. Khan Academy Kids is packed full of games and activities designed to entertain and educate young children. From sorting objects based on their color, to selecting the right letter to complete a word, to drawing and a whole lot more, there are apparently thousands of activities in here, and while we haven’t tested that many, the ones we have tested are varied and well put together, with colorful drawings, songs and sound effects. Most of the interactions use simple tap and swipe gestures, so most children should be able to navigate the app comfortably. A colorful character sits in the corner, and can be tapped whenever help is needed. There’s a lot here, and Khan Academy Kids should be suitable whether you want something your kid can do on their own, or something they can play through together with you. 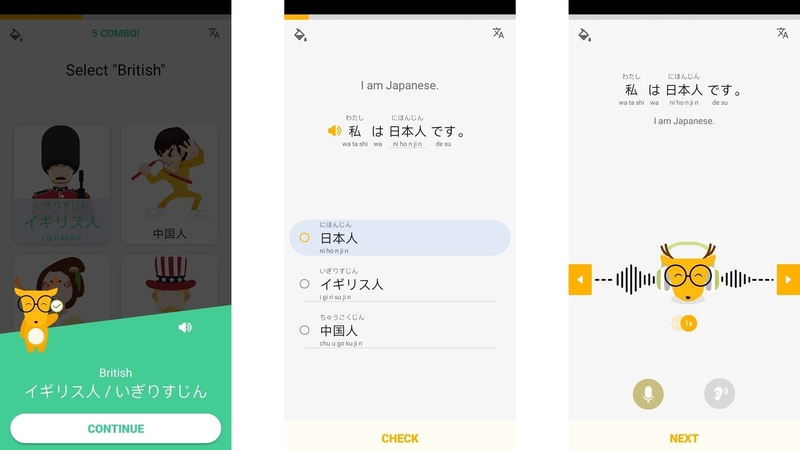 There are a lot of language learning apps on Android, but when it comes to languages such as Japanese, Mandarin and Korean, which have different alphabet systems, most apps fall a bit flat in teaching you to read and write in the language. But that’s where LingoDeer excels, with various exercises designed to teach you the alphabet and grammar, as well as more conventional lessons focused on speaking and hearing the language. LingoDeer can feel a bit intimidating at times, especially if you’re a complete beginner, as these alphabets can look completely alien, but we’re not sure there’s any way around that. Learning one of these Asian languages is going to be hard, and LingoDeer is a good way to get started. There are so many words in the English language, including all sorts of weird and wonderful ones that you might never have come across. But how do you come across them? Browsing a dictionary is inefficient, so instead you could try Orphic, an app dedicated to the more unusual and interesting parts of English. 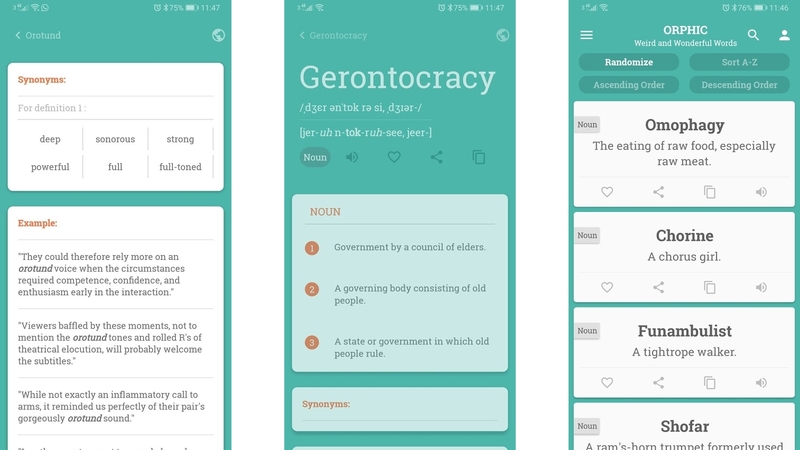 The app contains hundreds of words and will highlight a new one for you every day, even sending you a push notification for it if you want, so you can constantly learn new words. You can also head into the app and explore its library of language at your own pace. For every word you can see definitions, example sentences and even hear an audio clip, so you can be sure you’re saying it right. You can also add words to a list of favorites, so you can easily return to them later, and Orphic promises to add new words regularly, so the app should get better over time. Space Nation Navigator is an oddity. Part game, part learning tool, part fitness app – the only thing uniting it all is a focus on space. There are various ‘missions’ including mini games, such as memorizing codes to repair a spacecraft, quizzes, and even physical exercises designed get you ready for an outer space adventure. There are also videos and articles that teach you more about space and the people exploring it, while leaderboards give you extra incentive to carry out the various activities. There’s the slightly annoying need to buy ‘coins’ or watch adverts if you want to replay missions, but otherwise Space Nation Navigator is an interesting app for anyone with even a passing interest in space. A bit more focus might help, but there’s a lot of content here. Wherever you are, chances are there are hundreds of different plant species within walking distance, and most of us have no idea what all but the most common are called. 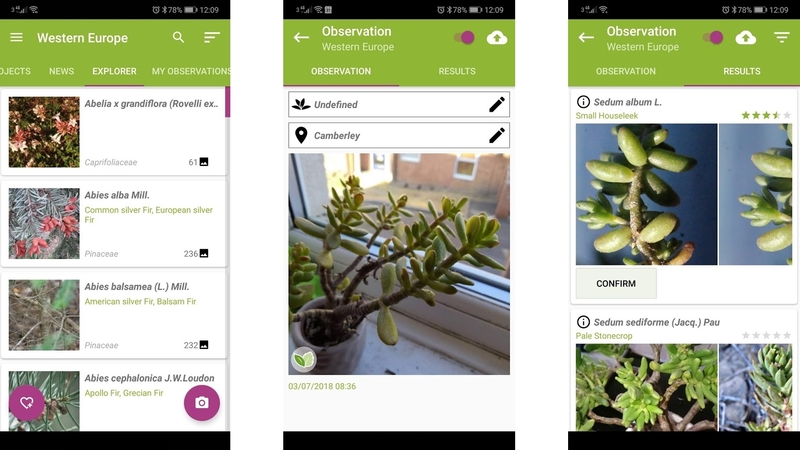 PlantNet aims to make identifying them easier – simply snap a photo and the app will attempt to identify what kind of plant or flower you’re seeing using visual recognition software. Assuming you’ve taken an in-focus shot with just a single type of plant in it you’ll probably get one or more suggestions, complete with names and pictures. This is probably the main thing you’ll use PlantNet for, but you can also view pictures submitted by other users and browse plants by a number of categories, such as where in the world they’re found. In many cases there are also links to Wikipedia pages about the plants, so you can learn more about them. As an identification tool PlantNet isn’t perfect, but it’s a whole lot better than nothing, and even if it can’t always identify the plant you’re looking at with 100% accuracy, chances are it will highlight some other interesting species in the process of trying. Today in History is exactly what it says on the tin, telling you what happened today in history, and as it turns out there’s usually a lot that happened. 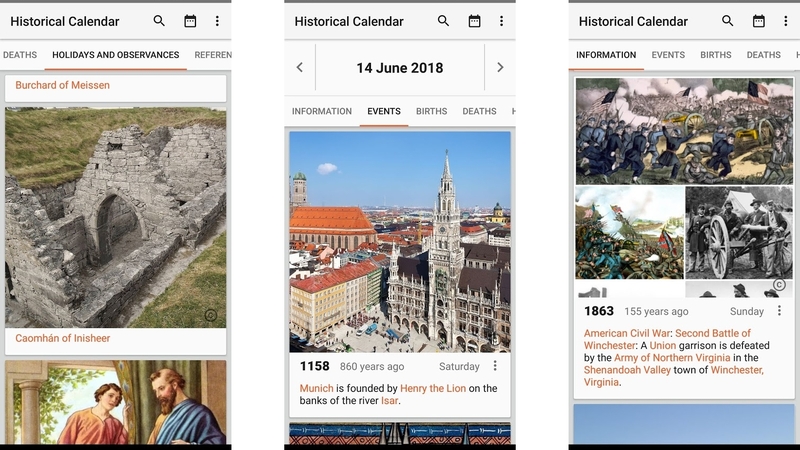 The Today in History app will tell you about events, births, deaths, holidays and just about everything else significant that ever happened on the current day, and it includes pictures, text and links to Wikipedia articles (which is where it pulls its data from). It’s an attractive app and even better if you use the widget, which shows you events from this day in history on your home screen. Today in History also lets you download content for offline use, get notifications and – for anyone who’s not a native English speaker – switch to one of 50 different languages, a switch which cleverly will also affect the events you see, with those relevant to the culture associated with that language being prioritized. The exercises are often presented a bit like puzzles. For example, very early examples task you with completing flags of countries by selecting the right code in the right order. This can feel almost like a game, and is engaging and enjoyable as a result. Did you know that the best time to buy a car is at the end of the month, since salespeople have quotas to hit and are more likely to cut you a deal? Or that you can get gum out of hair by dipping it in coke? If you had Life Hacks you would. 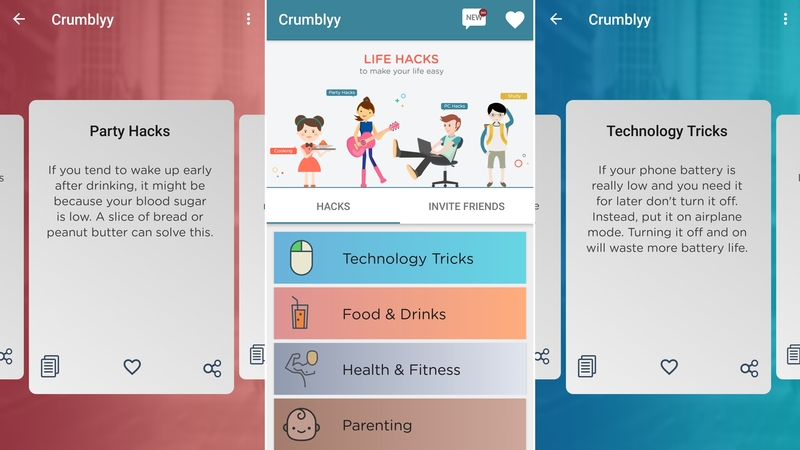 This appropriately named app has hundreds of hacks spread across various categories, such as ‘Money Savers’ and ‘Study Boosters’. Tap on a category and you’ll be shown a selection of cards, each of which has a life hack on it. The bottom of each card also has the option to favorite, copy or share it, so you can easily build up a library of useful hacks or share them with your friends. New hacks are also regularly added, so you won’t run out of things to learn. Some of the hacks are clearly aimed specifically at US users as they’re related to businesses like Walmart and Wendy’s, but most of them could be useful wherever you are. 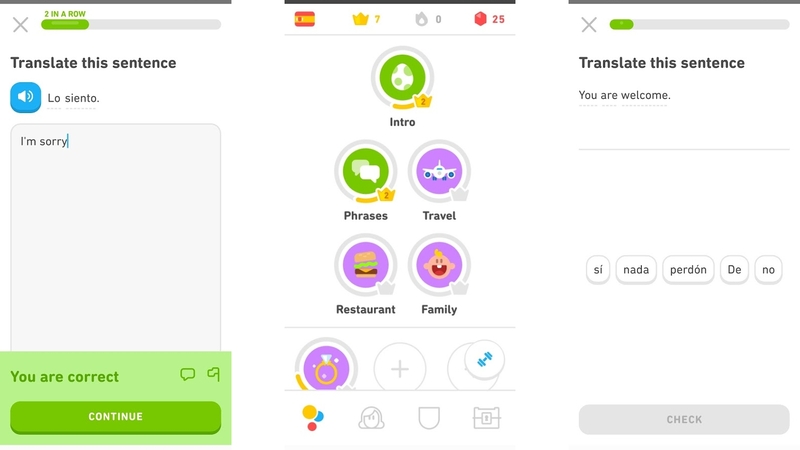 If you fancy learning a foreign language then make sure you download Duolingo: Learn Languages Free, as it's one of those rare apps that manages to be both educational and fun, ensuring that you'll keep coming back for more to brush up on your language skills, with bite-sized, genuinely useful lessons and tests. 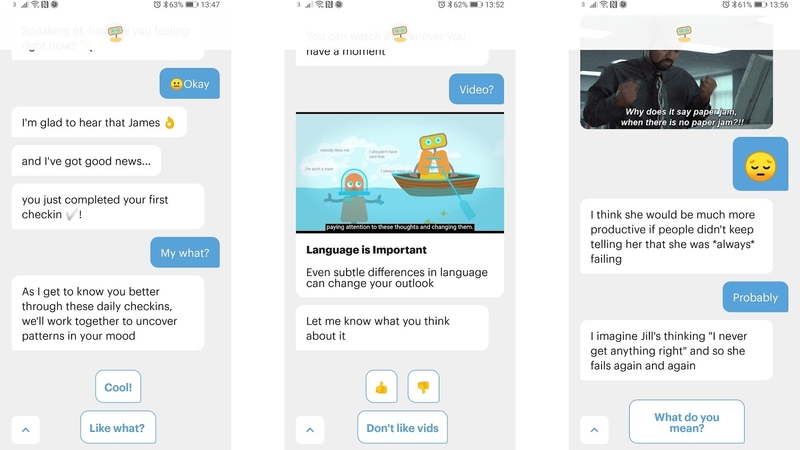 Spanish, French, German, Italian, Russian, Portuguese, Turkish, Dutch, Irish, Danish, Swedish, Ukrainian, Esperanto, Polish, Greek, Hungarian, Norwegian, Hebrew, Welsh, English, Swahili and Romanian can all be learned, it's mostly free and it's one of the best ways you can learn a new language with your Android device. Our favorite free Android apps for having fun on your phone or tablet, through watching videos, reading, socializing and more. Soon describes itself as a social bucket list app. What that means in this case is an app that lets you create lists of books you want to read, movies you want to watch, restaurants you want to try and more. You can select from a number of categories, including games, shops, bars, museums and TV shows, then make a list of the ones that interest you. To make a list, just type the name of the thing or place and Soon will usually be able to find it in its database, complete with information like the address if it’s a place or the cast if it’s a movie. Once you’ve read, watched, visited or otherwise interacted with a thing on a list you can tap ‘Done’, then rate and share your experience. Soon also has a trip planner, where you can select a destination and make a list of all the things you want to see and do. You can also share this list with anyone else you’re traveling with, so you can collaborate on it. All in all, Soon is a great app for anyone who struggles to remember the things they want to watch, visit, read, play and listen to, or just for anyone who likes making lists. Ever seen a picture of someone in an outfit and wondered what they were wearing or where to buy it? With LIKEtoKNOW.it you won’t have to wonder any more. 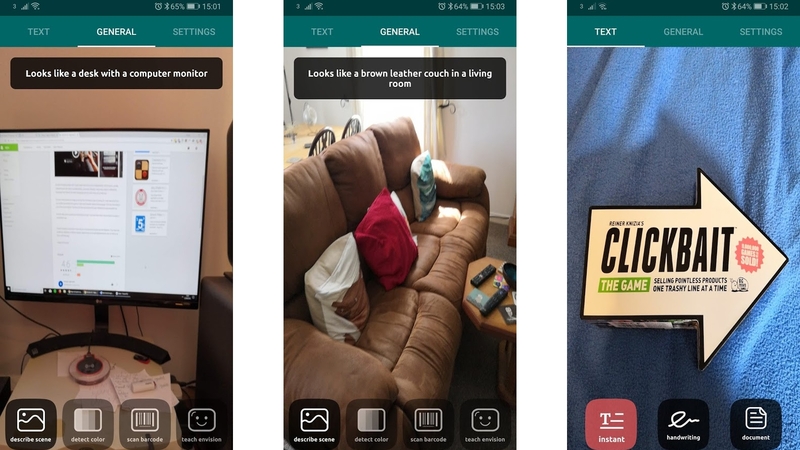 The app lets you take screenshots of photographs and can then tell you what’s being worn, as well as providing links to buy the clothes online. Or at least, it can sometimes. For any guarantee that it’s going to work, you should look out for captions containing ‘#liketkit’, the LiketoKNOW.it website link, or the LIKEtoKNOW.it logo in the bottom right-hand corner. Those things won’t exist on most images, but a growing number of fashion influencers will make posts compatible with the service. And that’s just one part of the app. 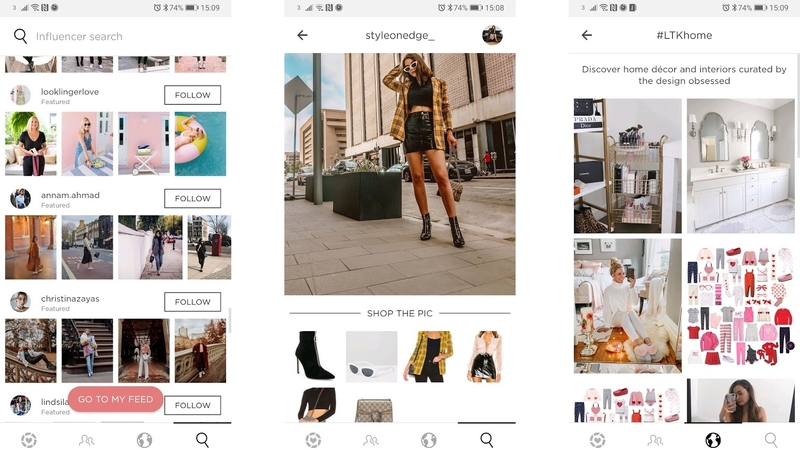 LIKEtoKNOW.it also lets you browse images and follow influencers from within the app, and all the images of course also have links to buy the products contained within them. By following people, you can create a feed full of content that you like, but you can also browse other feeds for specific categories, such as ‘fitness’ or ‘weddings’. Most of the content is aimed at women, but there is a men’s category too. There’s also some kids clothes and some décor – it’s not all just outfits. If you’re female and into fashion, it’s definitely worth a look. The Amazon Alexa app is essential if you have an Echo device, but previously it was an app you probably wouldn’t spend much time in. That’s all changed now though, thanks to an update that aims to make it the only app you need to control your smart home. It’s a similar overhaul to the one Google Home got, allowing you to turn lights on and off, control your thermostat and more. 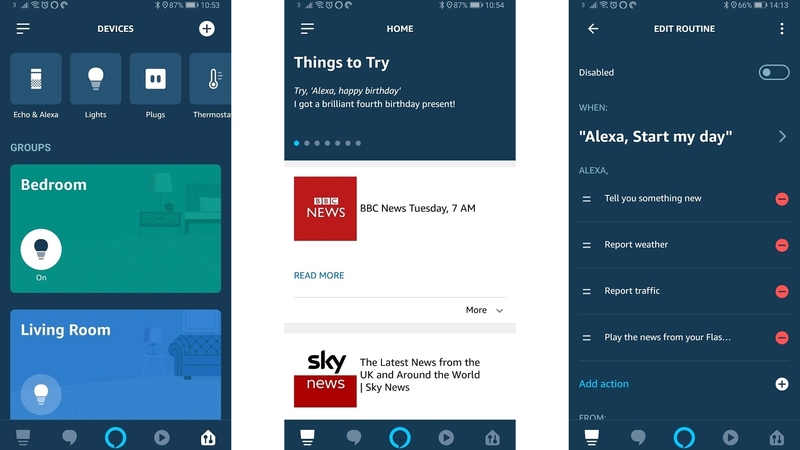 You can also control and set up aspects of Alexa from the app, of course, such as adding skills to it, managing timers and alarms and setting up Routines. The last of those is perhaps the most interesting, as these allow you to set a custom command that will cause Alexa to carry out a custom set of actions. For example, you could set the command “Alexa, time for bed” to turn off all your lights and turn down the thermostat. Esports still have a long way to go before they’re as popular as conventional sports, and part of what’s holding them back is accessibility, but that’s something the Blizzard Esports app could help with. 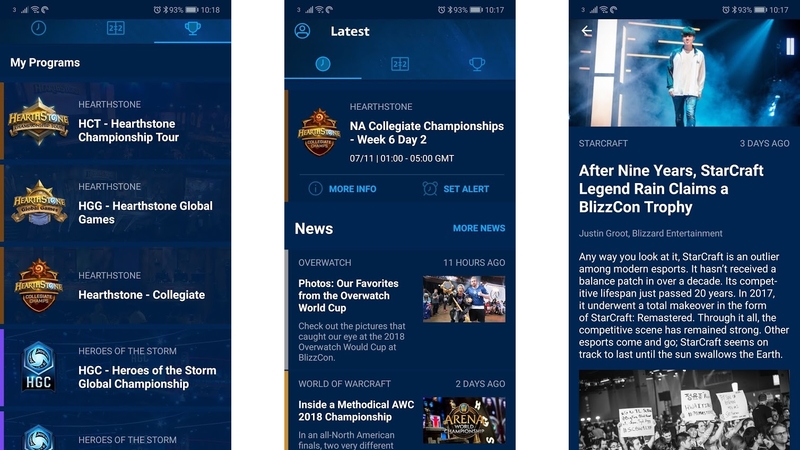 The app makes it easy to keep up to date with activity in Hearthstone, Heroes of the Storm, Overwatch, StarCraft, StarCraft II and World of Warcraft, offering schedules, scores, news and the option to set alerts reminding you to tune in when an event kicks off. When it’s time to tune in, you can do so via the Blizzard Esports app, so it’s a great companion for anyone into esports for the games above, or anyone who thinks they might want to get into them. Blizzard Esports is a little limited in that it only covers esports under the Blizzard banner. It won’t do much to help you understand the games being played if you’re completely new to them either, but for anyone with a bit of understanding and interest it’s a great addition to your app arsenal. For years Pocket has been helping people find the time to read all the articles they find online that would otherwise go ignored. You know the situation: you’re idly browsing but don’t have much time or should be doing something else, when you happen across an article that looks interesting. Maybe you plan to read it later and then forget, maybe you just resign yourself to the knowledge that it will go unread. But with Pocket, you can save it to a reading list so it won’t be forgotten, and make it available both offline and on just about any device with an internet connection, so you can read it wherever and whenever. 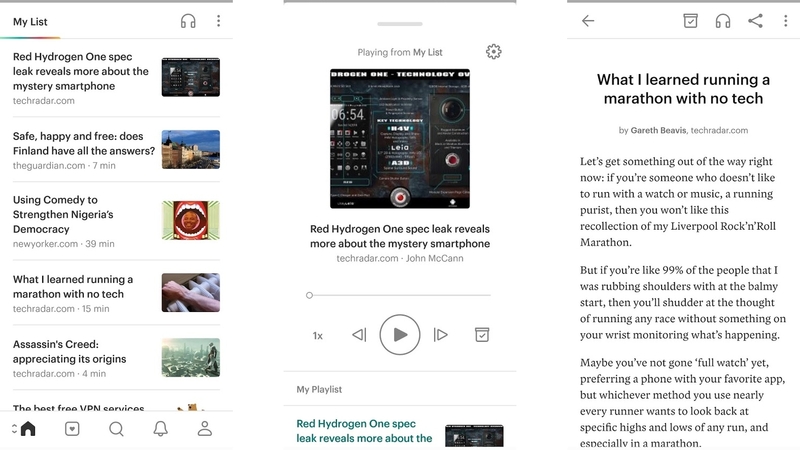 It’s a great app, but as of recently Pocket has got even better, as now you can also listen to articles you’ve saved, so you don’t even need to read them. Pocket’s look has also been updated in an attempt to make it more pleasant to read from for long periods. So if you’re not already using it there has never been a better time to start. Google Home isn’t a new app, but it has recently been overhauled, making it now perhaps the best solution for managing your smart home, particularly if you have smart home devices from a number of different brands. That’s because Google Home now lets you control them all from within the app. Or, at least, it does with most things. Inevitably some devices probably won’t be supported, but thousands are from hundreds of brands. You simply link them up to the Google Home app, then you can assign them to a room in your house, so that for example every smart device in your living room is grouped together. You can see all your devices from the main screen though, divided into these groups, and you can interact with some of them in a limited way from there (for example turning lights on or off) or tap on the device to do more with it (such as adjusting the brightness). You can also invite other members of your household to the app, so they can also manage smart devices from it, and the only real limitation is that some functionality isn’t supported. 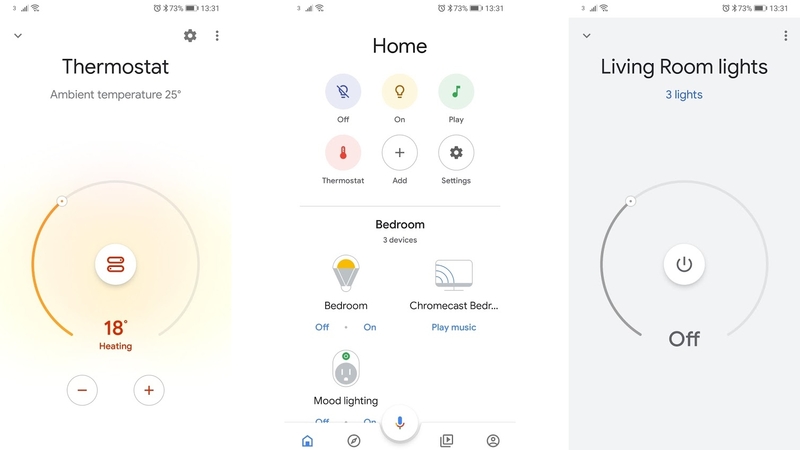 For example, with LIFX lights you can’t currently adjust the colors from Google Home, and with our Honeywell thermostat we can’t adjust schedules. But for the basics it’s a lot easier – and smarter - than jumping between multiple apps for all your smart devices. When was the last time you sent a letter? It’s probably been a while. It’s probably been even longer since you sent one that wasn’t a birthday card! That’s probably by choice – after all, why would you when texts and calls are so much faster? But there is something potentially appealing about the simple act of waiting for a letter to arrive. It helps make them feel less disposable and more important. Slowly aims to replicate that. It doesn’t see you putting pen to paper, but it does make you wait when sending and receiving messages. The result – if you’re anything like us – being that you value them and look forward to them more. Slowly isn’t really for sending messages to people you already know though. Rather, it’s for getting to know new people. It lets you send messages either to a random recipient, or to ones filtered based on metrics such as age and interests. Once you send a message, the amount of time you’ll be waiting for them to receive it depends on where in the world they are. It’s not quite as slow as snail mail, generally taking between a few hours and a day, so it’s a nice middle ground between an old-fashioned letter and an instant message. If you’re serious about your beer then you need Untappd on your phone. It not only has a database of beers for you to discover and rate, but also highlights nearby beer-related events and shows the beer menus in local bars. 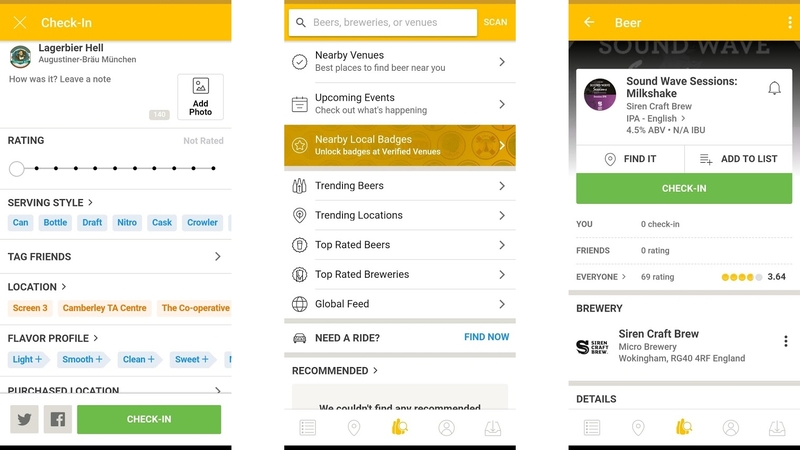 Add a venue to your favorites, and you’ll get alerts when it starts selling a new beer. There’s a social element too, which lets you follow friends to see what they’re drinking (and what they think of it). Whether you want to make a wish list to help you keep track of all the beers you want to try, keep a log of what you’ve already tried so you can remind yourself whether you liked something, or just keep abreast of all the beer-related happenings in the area, Untappd is for you. 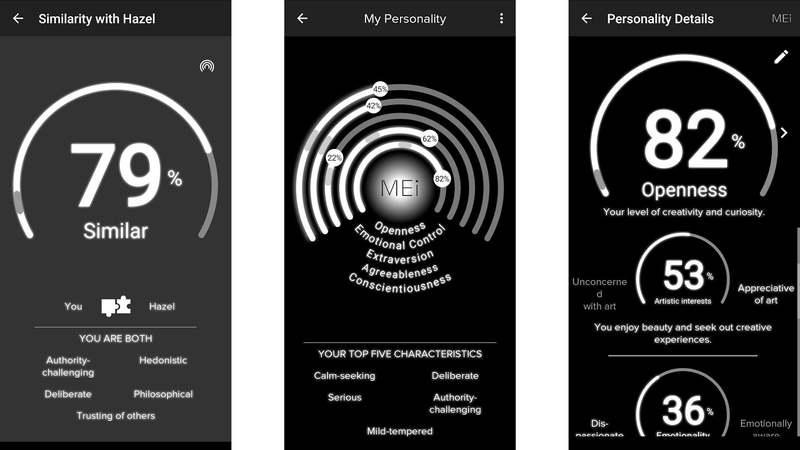 Mei: Messaging with AI promises a lot, but at the moment – at its core – it’s primarily an SMS app that can also analyze the messages you send and receive to show you a personality profile for you and the people who message you. It will tell you your top five characteristics, and assign a percentage score to your openness, emotional control, extraversion, agreeableness and conscientiousness. You can tap on any of these to dig deeper. For example, tapping on openness will show how adventurous, emotionally aware and imaginative you are in Mei’s opinion, among other things. You can also use the app to see how similar you are to the people you message and what traits you have in common. As well as standard SMS messages, if you’re talking to someone else who also uses Mei you get end-to-end encryption and free international messaging (due to messages then being sent over the internet), along with other tools such as expiring messages and the ability to unsend messages. The app’s in beta, and more features are coming, including additional AI abilities, such as the app being able to detect if you’re not texting as you normally would, perhaps because you’re in an unusual state of mind, and alerting you to that fact. Being in beta, Mei might not be totally bug-free, but it’s an interesting upgrade to your standard SMS app. Google News replaces Google Play Newsstand, and it’s a strong substitute. 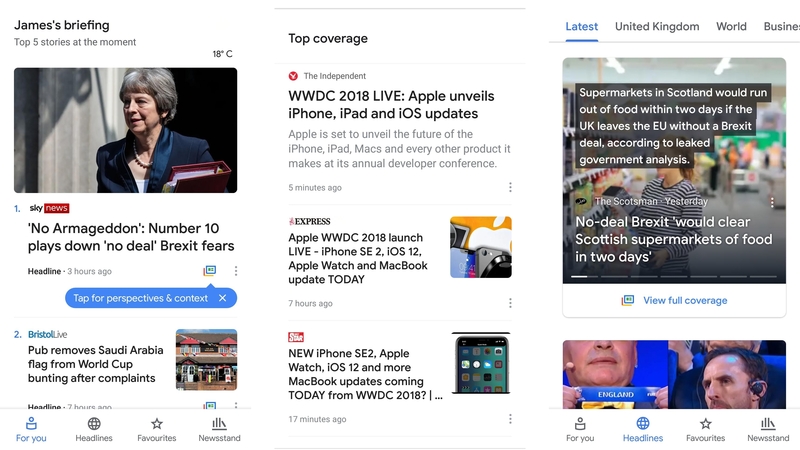 Throughout the day it will highlight the top five current stories that it thinks you’ll care about, based on the sources and topics that you tell the app you like, but if you keep scrolling down you can also see other news. The best bit about Google News though, might be the option to see ‘perspectives and context’. It’s a little button next to stories, which when tapped shows the same story as reported by various different sites and inevitably from various different perspectives, including some that you might never find on your own. As such it can give you a more rounded look at the news than you’d get if you’re always just using your preferred news source. Other features of Google News include the ability to filter headlines by subject or source, and subscribe to paid news sources with a single tap. Steam Link allows you to stream your Steam games from your PC to your Android phone or tablet, so you can play them from anywhere in your house. You are limited to your house though, as your computer needs to be on and using the same Wi-Fi network as your Android device for this to work. No Steam streaming on the train, then, but it’s quite freeing if you’re usually tethered to a desk. You also need a fairly fast and stable internet connection and most games will need you to pair your phone with a Bluetooth controller, though some simpler ones can be controlled purely touchscreen. Still, if you’re big on gaming but wish you could play your ‘proper’ PC games from the couch, bed or bath, then Steam Link is well worth trying. If you’re a movie lover then you might already know about Letterboxd, and if you don’t you should. 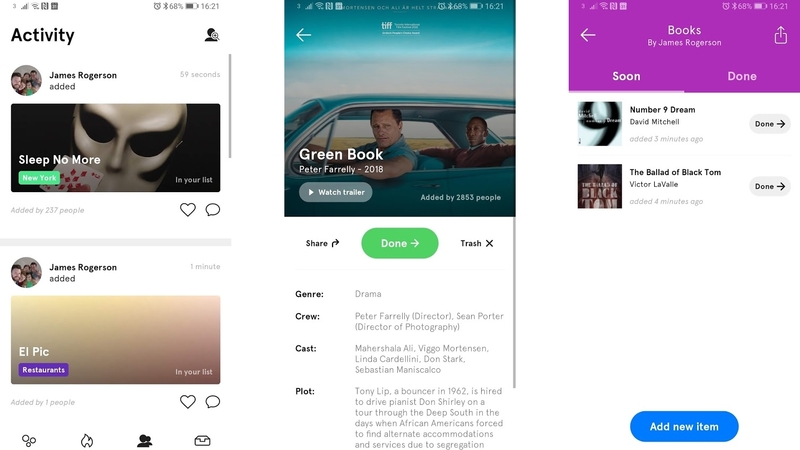 It lets you keep track of movies you’ve watched, add them to your list with a single tap, review them, give them a star rating, and say when you watched them. It also lets you keep track of what you want to watch, thanks to a comprehensive film database and the ability to add films to a watch list – again with a single tap. 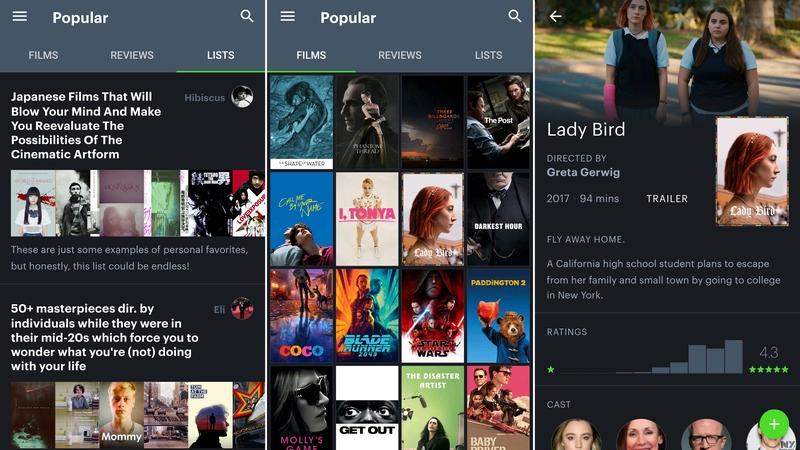 Letterboxd helps you discover films by highlighting what’s currently popular, and offering thousands of lists created by users of the app. These lists all have a theme, and while that’s sometimes as simple as someone’s favorite movies, usually it’s a lot more interesting than that, for example one list is titled “They aren’t films, they’re experiences”. Of course, you can also make lists of your own, and Letterboxd is a bit of a social network too, letting you follow other users and comment on their lists. 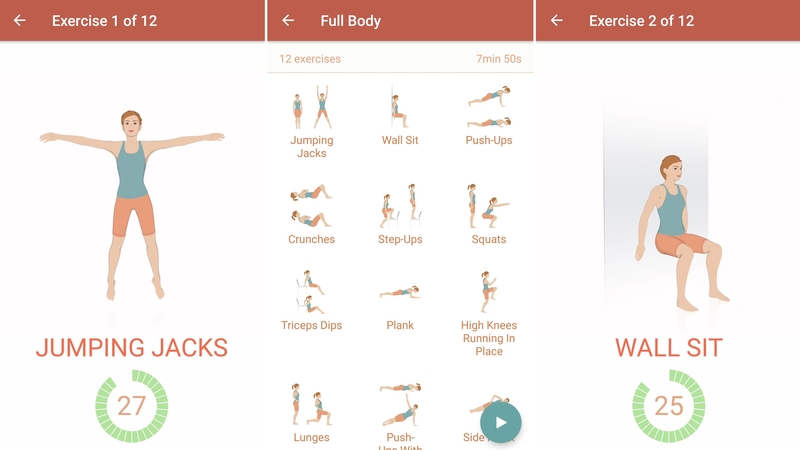 Our favorite free Android apps for working out, reducing stress and crafting meals. Cocktails aren’t the simplest drinks in the world to make, especially if you want to go beyond the basics, but Cocktail Flow helps make them more approachable. 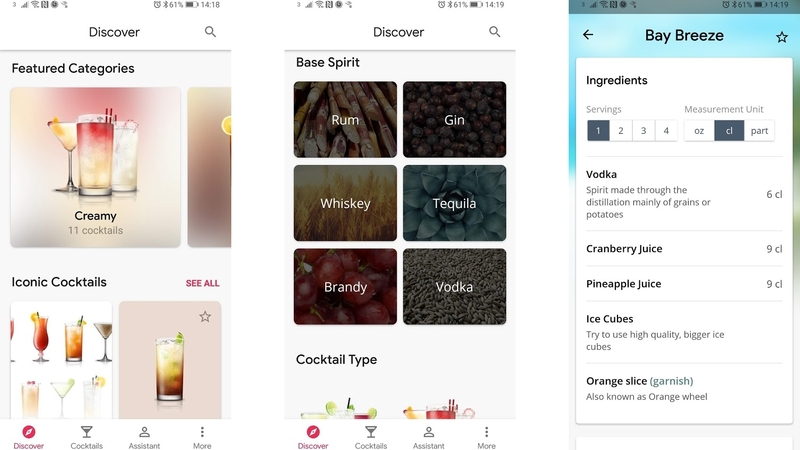 The app includes recipes for a number of cocktails (complete with lists of the ingredients and equipment you’ll need). And if you’re not sure what you want to make you can also browse based on the spirit you want to use or the type of cocktail, such as ‘creamy’ or ‘tropical’. You can also save any favorites, and if you’re intimidated by some of the skills needed to master them (such as making crushed ice and citrus twists), there’s a tips library to help. Cocktail Flow is a nicely designed, easy to navigate app too. It’s not new, but it has recently had a makeover, so if you’ve tried it before it’s worth revisiting. All of the basics are free, but you can massively expand the app’s cocktail library and add extra features – such as the option to add your own cocktails to the app – with a monthly $5/£4.49 subscription. Woebot was selected by Google as one of the best apps of 2018 and with good reason, as it could make a real difference to your life, especially if you’re struggling with mental health issues. 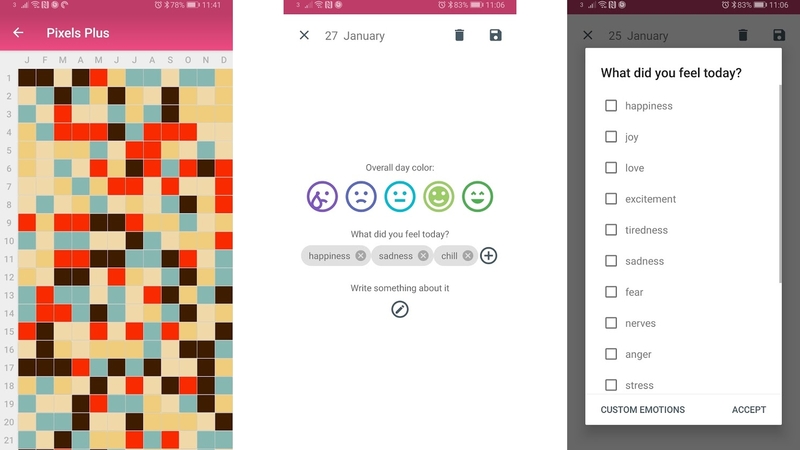 The app is basically a chatbot, but one which checks in with you daily to assess your mood and helps you work through any problems you might have, using Cognitive Behavioral Therapy principles. It tells stories with a message behind them, and provides tools and exercises to help you change your thinking, so you’ll hopefully end up feeling more positive in yourself, even if you can’t change what’s going on around you. As well as daily check ins you can also message Woebot any time you want to chat or feel down, and while it won’t replace actual therapy it’s a handy, always available tool that you’ll likely be thankful for when you need it. Endomondo is one of the oldest Android fitness apps and it’s still one of the best, thanks in part to regular updates. It’s packed full of features, letting you track not just running, cycling and walking but also more than 60 other activities -, so if there’s a sport you do, chances are Endomondo has some tools to help you monitor it. GPS monitoring lets you track statistics such as distance and pace, but you can also manually log indoor workouts or anything else where GPS won’t be much use. 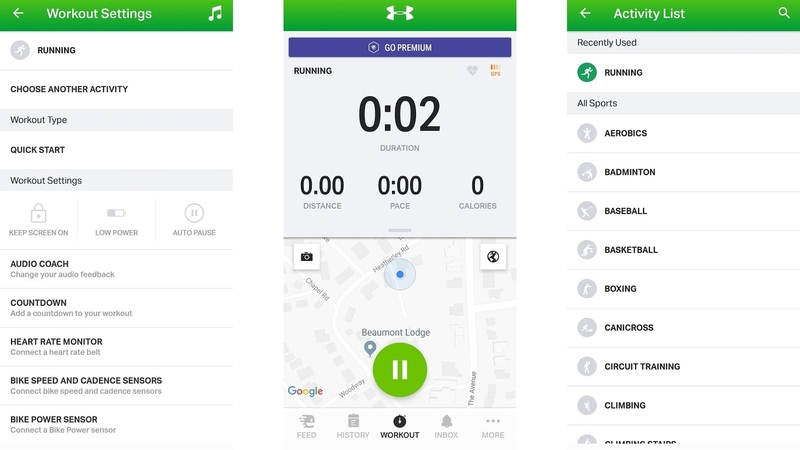 Additionally, Endomondo can be paired with other accounts and wearables, such as the Fitbit app and heart rate monitors, allowing it to sync data with them. 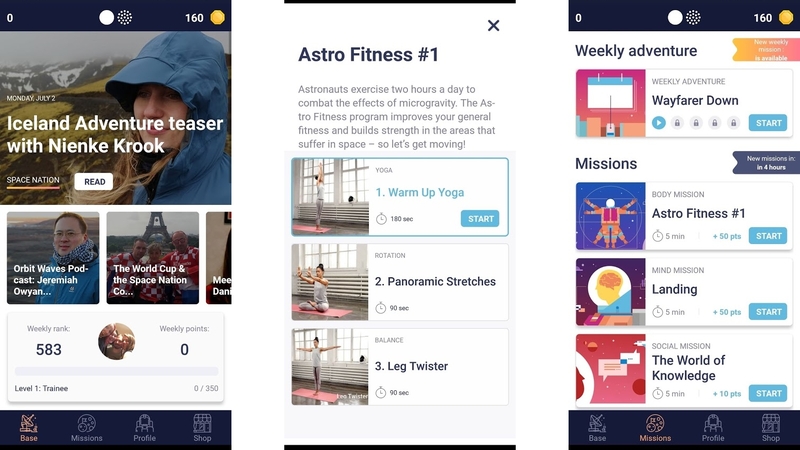 With custom goals, challenges (that in some cases even have prizes) and the ability to compete with friends, there’s a lot to keep you motivated and the app itself is slick and easy to use. 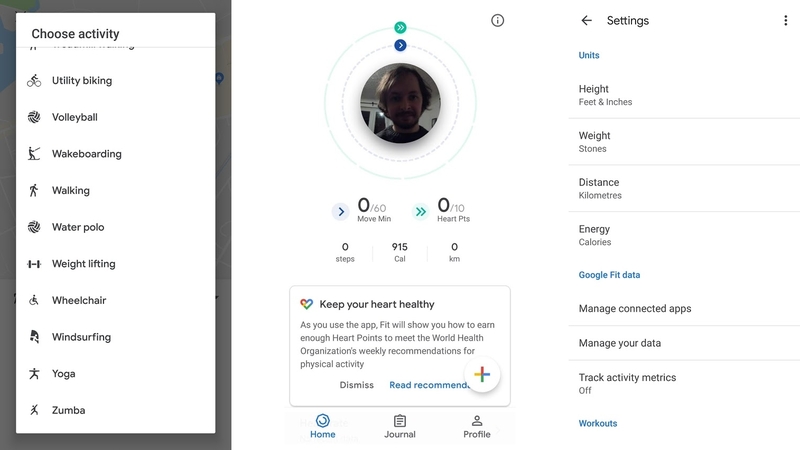 All of these features are free, but you can unlock various extra tools such as personal training plans and advanced statistics if you subscribe to Endomondo Premium, which costs £9.99 (around $13) per month, though it’s only around a third of that price if you commit to a year. 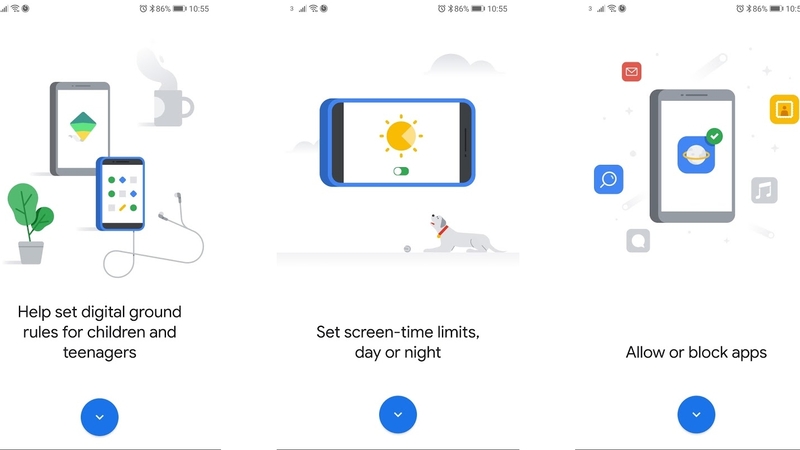 Google’s official health and fitness app, Google Fit has been around for a while, but it’s now been overhauled and is better than ever as a result. At the heart of the overhaul there’s ‘Move Minutes’ and ‘Heart Points’. The former records your general movement throughout the day and aims to encourage you to make small changes, such as walking up stairs rather than taking the elevator. 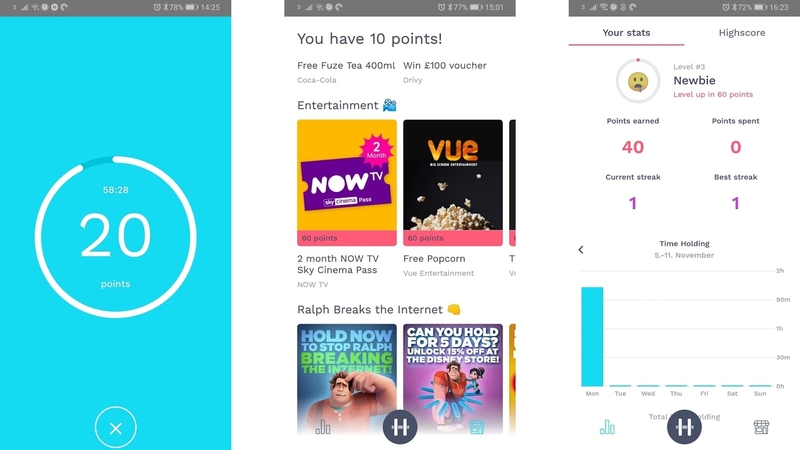 Heart Points reward you not just for the amount of time you’re active but for how much you raise your heart rate - a feature which really helps the app stand out. In line with most fitness apps, the core features are still available; you can track various workouts, monitor and adjust your goals, and even get some basic customized tips and coaching, based on the activity that you do. If more than one person in your household buys groceries, then Bring! is an app that you should really look into. 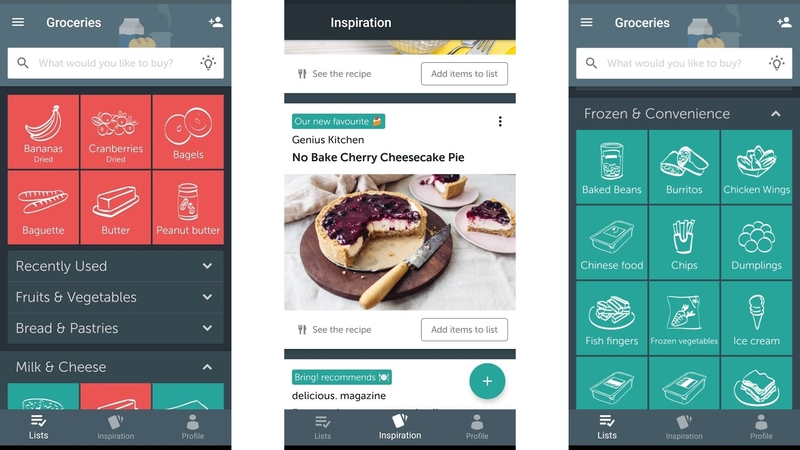 It’s a grocery list app, as you might have surmised, but it lets you share and collaborate on lists, so everyone who might buy something can see the current list, and anyone else in the household can see it and add to it. Whenever someone does buy things from the list they can tick them off with a tap, so there’s no danger of the same thing being bought twice. Bring! also lets you add photos to each entry, which is handy if you want to add something very specific, such as a certain brand of item, or if you just want to add some color to the list. But Bring! also has its own database, with images for hundreds of items. You can create and share multiple lists if, for example, you have a general grocery list and another one for a party. There’s even a recipe section, designed to inspire you to cook, and making it easy to add all the ingredients to your shopping list. Technically there’s no reason you couldn’t use Bring! for other types of shopping lists as well, or even for to-do lists, but it’s designed for – and excels at – groceries. 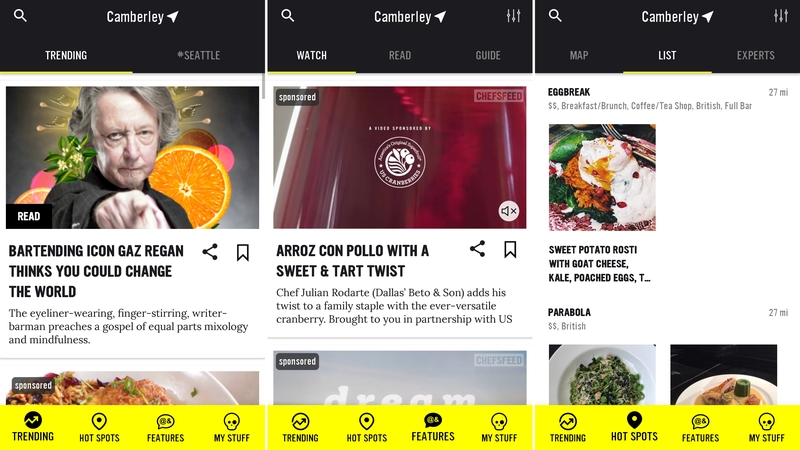 From the name you might think ChefsFeed is a recipe app, or maybe a social network for chefs, but while there’s an element of both it’s so much more than that. ChefsFeed, really, is for anyone who loves food. It has articles and videos about food and restaurants, and yes, some recipes, but most of it’s not so much about cooking your own dishes as it is about food culture, with articles titled ‘why restaurants are a refuge for the restless’, and ‘sourcing sustainably is a way of life’, for example. The app also helps you find new places to dine out, with a section highlighting interesting and recommended restaurants near you, complete with their opening hours and contact details. You can filter these suggestions by price, distance and type of food, among other things, and save your favorites, so you’ll never forget a place you planned to try. Seven – 7 Minute Workout Training Challenge promises to get you fit in just seven minutes a day, and while a longer workout might do you more good, we can’t deny that this got our hearts racing. There’s a wide variety of exercises and workouts, with an animated man or woman showing you how to do each one, along with an optional text explanation. So far, so standard, but Seven also doles out achievements, lets you add friends for some friendly competition and has specific training plans for different goals. For example, if you tell the app you want to lose weight, it will give you different workouts to if you want to increase your mobility. The exercises in Seven don’t require any equipment, so you can do them from home or even your office if you have a bit of space, and you can create your own workouts too if there are specific exercises that you like. Seven is partially free, but there’s an optional US$9.99/£9.99 monthly subscription which unlocks additional workouts, exercises and personalized workout plans. If you like the free version, it could be worth considering. 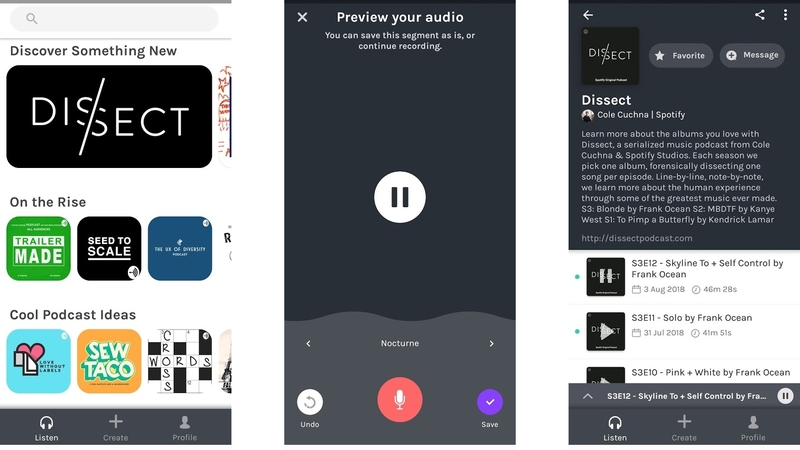 Our favorite free Android apps for making music, listening to music, finding podcasts and everything else to do with audio. Radio by Deezer is a slick if slightly basic radio player app, and although it comes from Deezer (a company known primarily for its Spotify-like subscription service) it’s free to use. The app has around 30,000 FM and online radio stations sorted into various categories, such as ‘pop’ and ‘rock’. So you can browse them that way, or search for a specific station. Stations that you recently played or play the most often will be added to lists on the ‘My Stations’ tab, though in a weird omission there’s no way to manually add stations to your favorites. You can however favorite songs that are being played, but unless you have a Deezer subscription this will just show you a list of them, rather than actually letting you listen to them again. It’s an app that needs work, but it looks good, is easy to navigate and makes for a great companion to the main Deezer service. BBC Sounds brings all of the BBC’s live radio content and podcasts to one app, so you can listen live on your phone, and subscribe to and stream podcasts. 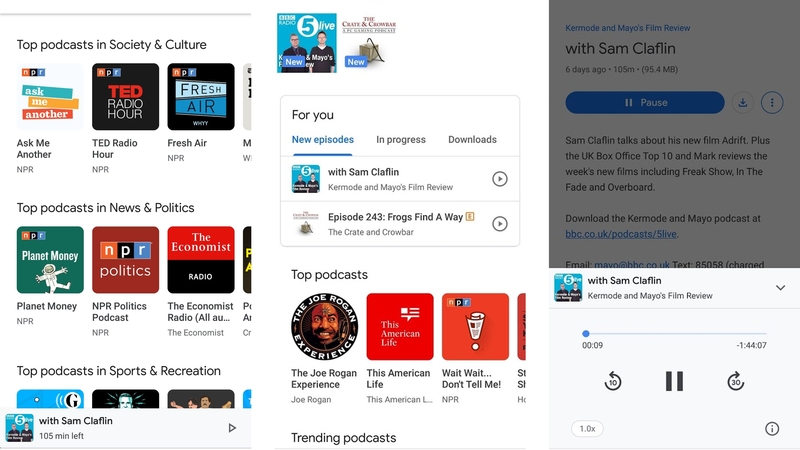 BBC Sounds also lets you pick up where you left off on another device, so if you get halfway through a podcast on your phone, you’ll be able to start from that point on your tablet automatically. It can also recommend content based on what you’ve been listening to, so it’s a good way to discover new things. 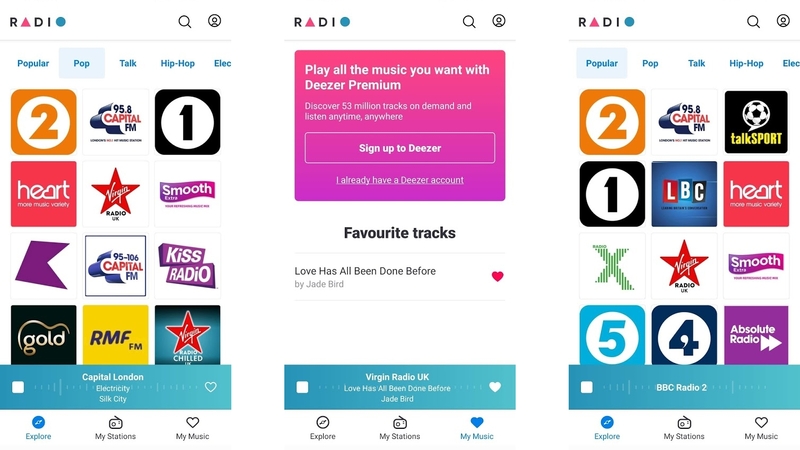 It’s basically iPlayer for radio (in fact the plan is for it to ultimately replace BBC iPlayer Radio) and if you listen to a lot of BBC content it’s arguably a smarter, better choice than listening on a radio or using another podcast app. 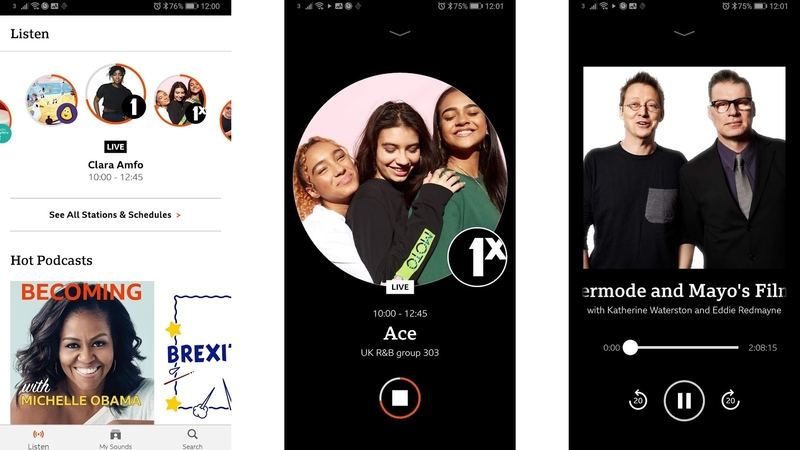 At the moment the BBC Sounds app is UK-only, but given that the iPlayer Radio app is available globally we wouldn’t be surprised if BBC Sounds is one day too. SW True-Fi Beta aims to maximize the potential of your headphones by tuning sound settings specific to the headphones you have plugged in. You do this by selecting yours from a long list of supported headphones, then True-Fi does the rest. But you can also adjust the sound according your age and make manual tweaks to aspects of it, such as the bass. 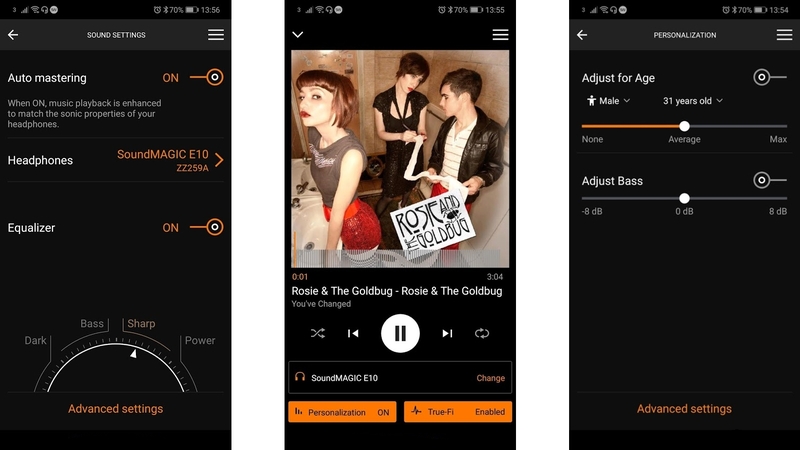 The adjustments only work when playing music through the SW True-Fi Beta app, but that needn’t be a problem, as not only can it play local music files, it can also connect to Spotify and play music from there. Not all headphones are currently supported, which is the main limitation of the app, but if yours aren’t then you can contact the company to ask them to be added. 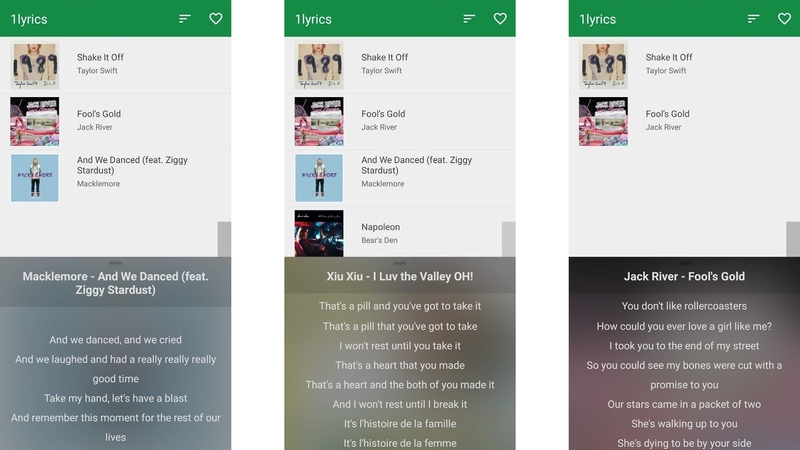 1lyrics is designed to show the lyrics to songs as you listen to them, but handily you don’t need to play the songs in 1lyrics itself, instead it supports numerous music players, including ones that use locally stored songs, and streaming players, such as Spotify. Just start listening to a track on your player of choice then open 1lyrics and it should show the lyrics to the current song. In some but not all cases it will even scroll them in time with the music. Lyrics that you’ve viewed in the past are saved, so you can access them at any time, even if you’re not currently listening to the song in question, and it’s quite an attractive app, pulling in artwork for the songs it provides the lyrics to. There are some caveats here. 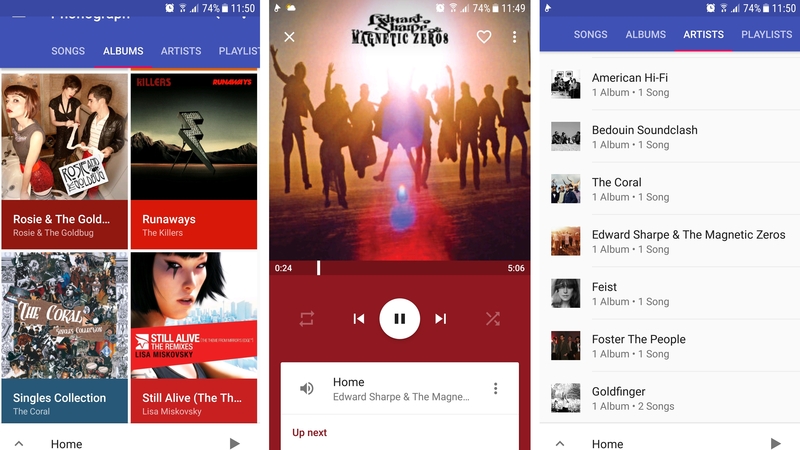 For one thing, it doesn’t currently work with all music players, though more are set to be supported over time. It also doesn’t have lyrics for every song, though we tried some semi-obscure stuff and it found lyrics without any issue, so you should be able to get lyrics for most things. 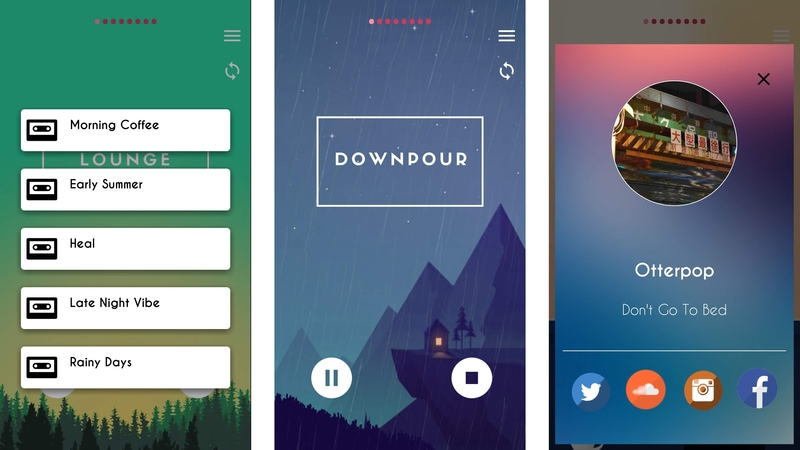 Anchor is both an app for both listening to podcasts, and creating and sharing your own. It’s that second part that’s the most interesting. You can record audio straight from the Anchor app, or import recordings. You can also add friends to a recording, even if they’re elsewhere in the world, allowing you to have a recorded conversation that you can use as a podcast. You can add various sound effects, and rearrange and edit parts of the podcast, so you’re not limited to a single audio file. Once you’re done you can share your podcast, not just on Anchor itself, but also on the likes of Google Podcasts and Apple Podcasts. When it’s out in the world, you can use Anchor to track how many listeners it has, and which parts of the podcast are most played. If all you want to do is listen to podcasts then there are other apps that do the job just as well or better (Pocket Casts is always a favorite), but Anchor is a slick, simple way to get into podcasting yourself. 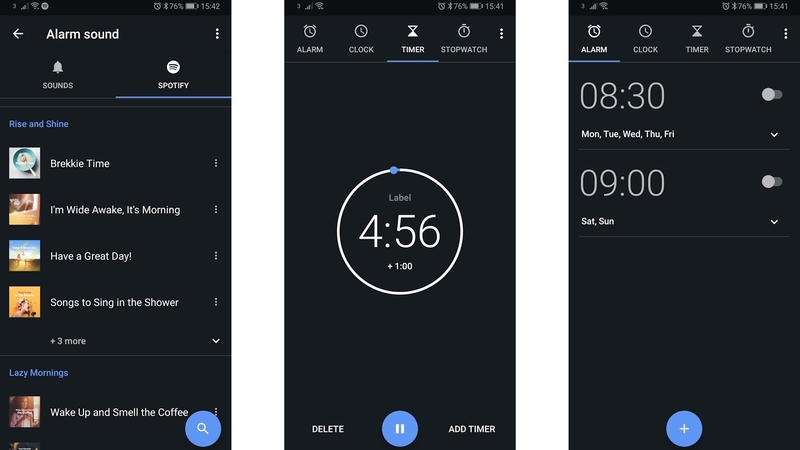 Google Clock (or simply ‘Clock’) is a fairly ordinary clock app in many ways, but it has the polish you’d expect from Google and is now better than ever, thanks to Spotify integration, meaning you can set a Spotify song or playlist as your alarm. That instantly gives it an advantage over many clock apps, and the fact that Google Clock is free doesn’t hurt either. Beyond that you get a timer, a stopwatch, the ability to create and save multiple alarms, and the option to view times for other parts of the world. Of course, it also has Wear OS integration, so all of your alarms and timers can be synced with your wrist, and there are several options to tailor the app to your preferences, such as being able to change the clock style and the snooze duration. There are plenty of podcast apps already but when Google makes one it’s worth paying attention, and Google Podcasts doesn’t disappoint, instantly reaching the heights of the best free ones. It’s got a minimalist design that’s light on color, but the app’s not light on features, as it automatically syncs podcasts across devices, so you can start listening on one and finish on another, it works with Google Home and you can launch straight into podcasts from Google Assistant and the Google Search app. Google Podcasts also gives you recommendations based on your listening history and preferences, so it’s a decent way to find new content, and there are other tools, such as the ability to change the playback speed. None of which would matter if it didn’t get the basics right, but it does, letting you subscribe to podcasts and highlighting new episodes on the main screen, letting you stream or download podcasts, and providing lists of the top podcasts in various categories. If you like to have relaxed background music on while working, reading or anything else, then Loffee is definitely worth a download. The app contains a handful of curated playlists, all featuring lo-fi music that’s ideal for relaxing to or having on while you do something else. To our mind, the music choices are great, as well as often featuring little known bands and artists, so you’re sure to find things that you like and haven’t heard before. If you do, you can follow links to the artist’s Facebook, SoundCloud, Twitter and Instagram pages, while other tools in the app include a timer (which shuts the music off when it finishes counting down), and the ability to listen to songs offline. The Loffee app itself is also something you’ll want to spend time in, as each playlist has a custom illustration that’s almost as soothing as the music. You can’t cast music to other devices and the actual selection of songs is small, so this won’t replace your main music apps, but it could definitely complement them. 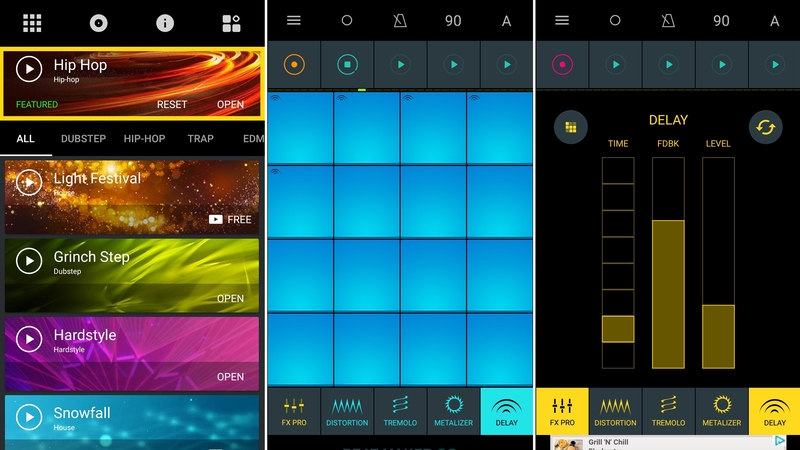 Drum Pads – Beat Maker Go is a drum machine which lets you easily make beats on the go. There are numerous sound packs split across various genres, such as dubstep, EDM and hip-hop, and once you select one you can get tapping on the drum pad. There are various effects that you can apply to your track, such as distortion and delay, you can create loops and save your finished pieces, then share them with friends. Drum Pads is accessible enough that beginners should be able to have fun with it (though some trial and error will be required), but there’s enough here to appeal to more advanced users too. It’s probably fair to say that most ringtones that come with phones aren’t very exciting, and while you can easily set a locally stored song as your ringtone, you won’t necessarily want the whole thing. That’s where Ringtone Maker & Music Editor comes in. 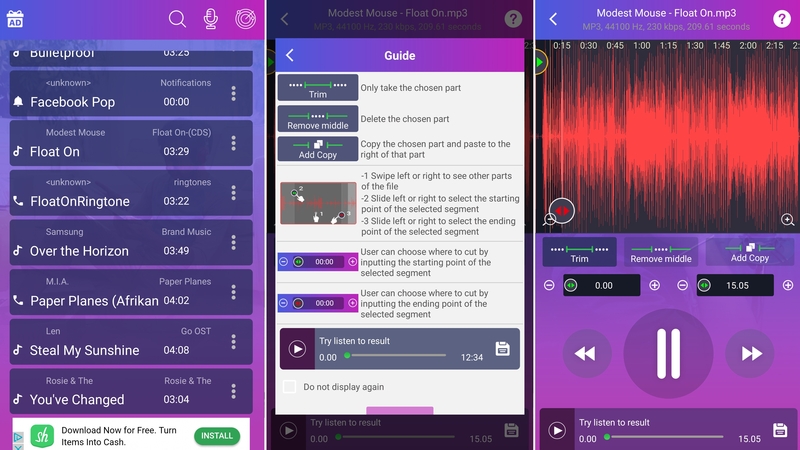 First, you can get this app to scan your device for any stored audio files, sort them by track, album or artist, then select the one that you want to turn into a ringtone and you’ll be able to choose a start and end point – handy for cutting boring intros. You can type out exactly what point in the music you want to start and end the ringtone down to the millisecond, and you can also cut parts of the music, copy and paste parts, or even meld multiple audio files together. There’s also a basic recording feature built in, so you can record your own ringtones and then edit them. Once done, you can save your ringtone and assign it either system-wide or to a specific contact. Ringtone Maker is easy to use and supports various file types, including MP3, FLAC, OGG, WAV, AAC, M4A, MP4 and 3GPP/AMR, and the only real issue it has is the number of adverts, but there’s a pro version that gets rid of them for US$3.99/£3.29. Bandcamp is a service that highlights and sells music from numerous artists, mostly of the independent variety, and with the Bandcamp app you can access all of its content from your phone. As well as buying music, you can stream or download music you already own, and in many cases stream songs that you haven’t yet bought. You also get access to a weekly podcast that highlights music you might not have come across before, so it’s a good way to discover your next favorite musician. You can also search, browse, add things to your wishlist and comment on releases, sharing your thoughts with the wider Bandcamp community. 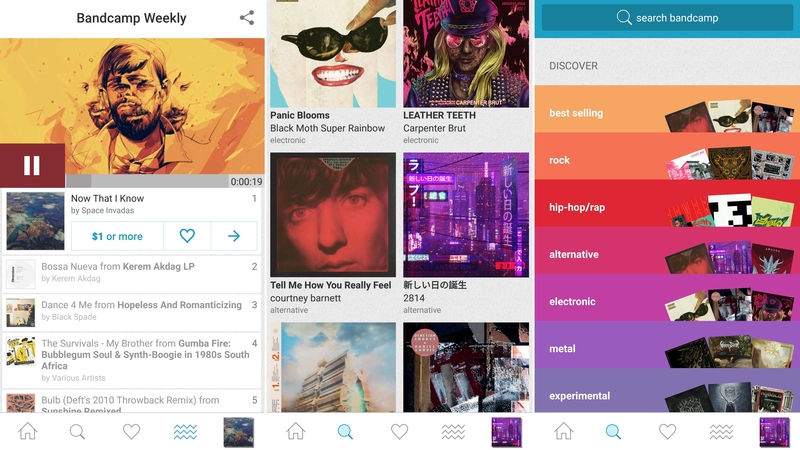 It’s a handy app if you’re into music (and who isn’t?) and a great way to support up and coming artists. If you play an instrument then you probably sometimes need backing tracks, and Backing Track Play Music can provide them. It has thousands of backing tracks designed for guitarists, bassists, drummers, keyboardists and singers, and you can filter by instrument, genre, artist, or just perform a general search. The selection is decent and varied, covering many big hits from artists of various genres. 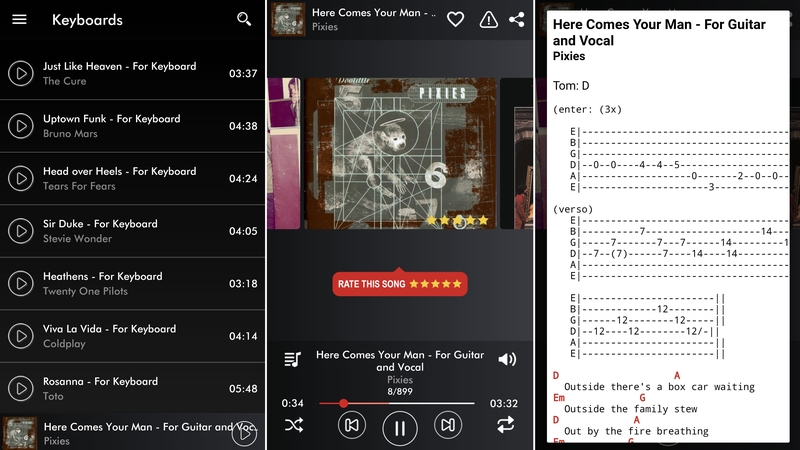 You’ll also find lyrics and tablature for many songs, and the app claims new backing tracks are added every day. The core app is free, but if you want to get rid of adverts and be able to download backing tracks for offline use, you can grab Backing Track Play Music Pro for $1.49/£1.29. While many of us have moved to streaming music, there is still a place for locally stored music on Android, and Phonograph is one of the better players. Phonograph puts aesthetics and ease of use first, so it’s always pleasant to operate. The app has a Material Design look that fits with Google’s vision of Android, but it’s also packed full of album art and color, so there’s never a dull screen. You can also customize the colors and overall theme and look of the app, while the color of the main ‘now playing’ screen will change based on the album artwork of the current track. The layout is simple too, with your music library sorted by song, album, artist or playlist, and you can switch between views with a swipe, while most other options are no more than a tap away. Although not as feature-packed as some players, Phonograph has a number of handy extras and toggles, like gapless playback, information and images pulled automatically from Last.fm, a sleep timer, widgets and lock screen controls. Timbre’s full name is ‘Timbre: Cut, Join, Convert mp3’, and that tells you almost everything you need to know about it: this is an app for cutting, joining and converting files. But the MP3 bit in the name rather undersells it, because Timbre can also work its magic on WAV, FLAC, M4A, AAC, PCM, AIFF, Ogg, WMA, ALAC, MP4, AVI, FLV, MOV, WebM, MKV and MPEG files. You can convert from one file type to another, which is handy if, for example, your music or video player doesn’t like a specific file type. You can also trim down audio and video files, or combine several files into one, which you might want to do if you’re editing together a video with multiple scenes, or making a mixtape. Those are the headline features of Timbre, but there are also tools to remove audio from a video file, split a single audio file into two parts, and change the bitrate of an audio file. All of these things are simple to do, with Timbre sporting a clear interface, and it’s completely free as well. 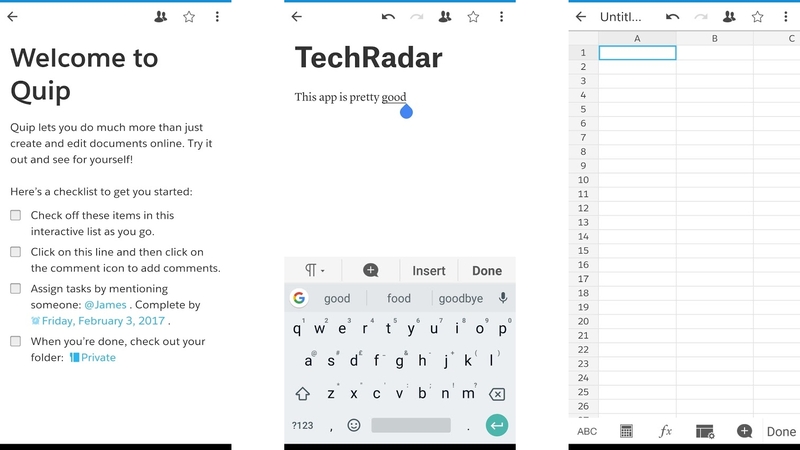 Our favorite free Android apps for taking notes, writing and editing documents and generally working on the move. Business cards are a somewhat dated concept but they still serve a purpose, so in an attempt to bring them into the 21st century, HiHello Contact Exchange makes them digital and even easier to share than the physical kind. The app lets you create multiple different cards containing different information. You might for example have a work card that contains your work email and job title, while a personal card could have your personal email and Facebook link. 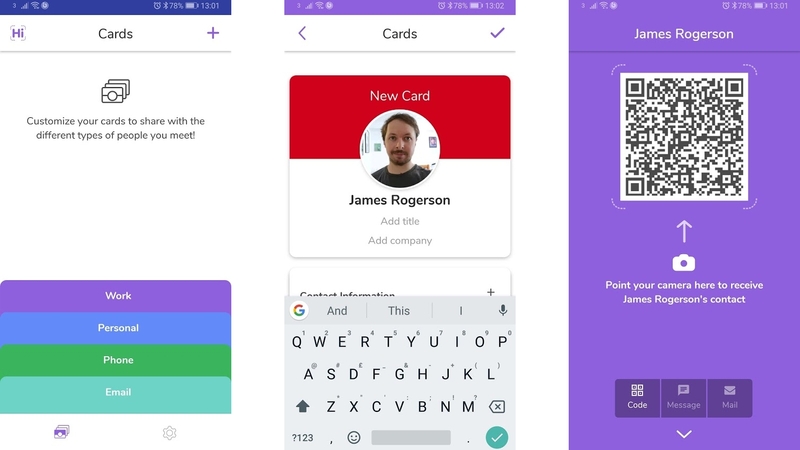 Lots of different things can be added to each card though, including your phone number, website, Instagram, Snapchat, LinkedIn, Twitter and more. To share a card you just launch the HiHello app, tap on the card you want to share, tap the share button to display a QR code and then the person receiving it simply points their phone camera at the QR code to get it. Alternatively you can email or text the card to someone, so unlike a conventional business card they don’t need to be physically present to receive it. And the card can be saved to their phone’s address book, meaning they don’t need the HiHello app themselves. Notes by Firefox is a very simple note-taking app, ideal if you just want to jot down basic notes without wrestling overbearing interfaces and unwanted options. The look is minimalist, with a mostly white screen housing all your current notes. You can tap on one to open and edit it, tap the plus button to make a new note, or tap the minus next to a note to delete it. There are a few formatting options – you can create bullet points or numbered lists, add headings and use bold and italics, but that’s about it. However, Notes by Firefox does have a few tricks up its sleeve, as it syncs between your Android device and the Firefox browser on your desktop, so you can access your notes from multiple devices, and they’re secured with end-to-end encryption. Other than that, this is a basic app, but if you’re not a power user it should be all you need, and it’s completely free. Quip is an office suite built for teams, as not only can you create documents and spreadsheets, you can also share them with others and work on them collaboratively. It supports real-time messaging too and while this app will mostly be of use for teams of people who work together it could also be used for other things, such as shared grocery lists and to-do lists. You can access it all from your phone, tablet or computer, so you’ll never be far from the work and information you need, and Quip is quite full-featured when it comes to actually creating documents and spreadsheets, as for example it supports over 400 spreadsheet functions. You probably won’t want to make much use of them from a phone, but if you’re on a tablet then Quip is a great way to work on the move, and even on a phone it can be good for reading, editing and commenting on work. Otter Voice Notes is a voice recorder, but that’s just the beginning. It also uses AI to automatically turn the recordings into written text so you can read them back rather than having to listen to them. The app also lets you search for keywords, so you can find exactly the piece of information you’re looking for in seconds, even in long recordings. 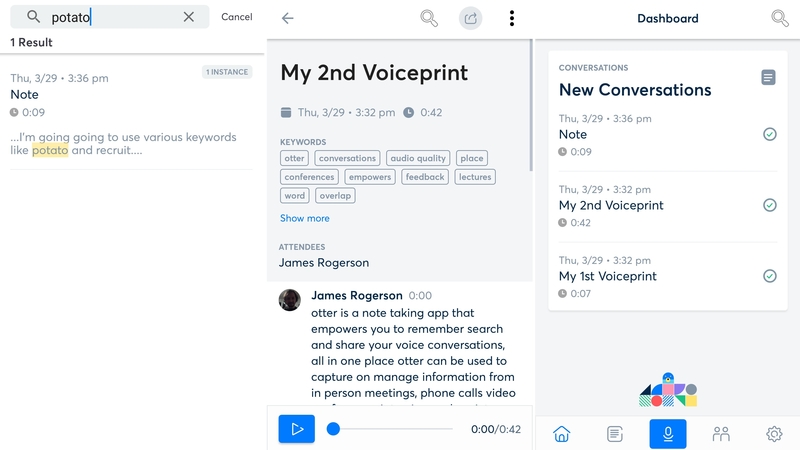 This all makes it a great tool for recording meetings, lectures and the like, especially since Otter can be trained to recognize voices and you can tag who’s talking, so that even in text form you can see the true flow of a conversation. You can also create groups with other Otter users if you want to share recordings, and all of your recordings are saved in the cloud so you can access them anywhere and don’t have to store them on your Android device. The text transcription isn’t perfect (though Otter claims it will get better over time if it’s you talking, as it gets to know your voice better), but it’s reasonably accurate in our experience and you can always go in and make changes to the text manually. TouchPal is a truly feature-packed keyboard, and an enormously customizable one at that. Not only can you select from thousands of free themes, you can also create your own, picking a key color and adding a background image or color. All the usual settings are also available, letting you customize the keyboard height and width, change the key layout, enable or disable auto-correct and much more. 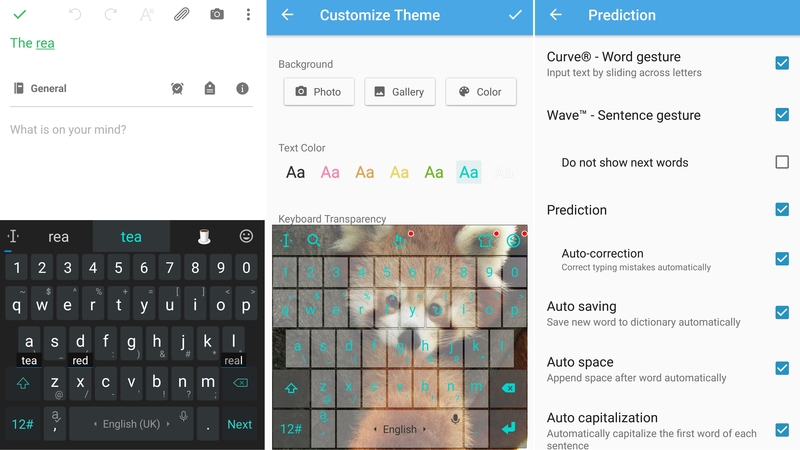 There’s also a ‘Curve’ mode, which lets you swipe across keys to select them rather than tapping, and more uniquely a ‘Wave’ setting that builds on predictive text by putting AI-driven next word suggestions under the keys as you type. You can also access various emoji and GIFs from the keyboard, bring up a Google search and use voice typing. None of that would matter if TouchPal was slow or inaccurate, but in our tests it works well – just as long as you take the time to get it set up how you want it. 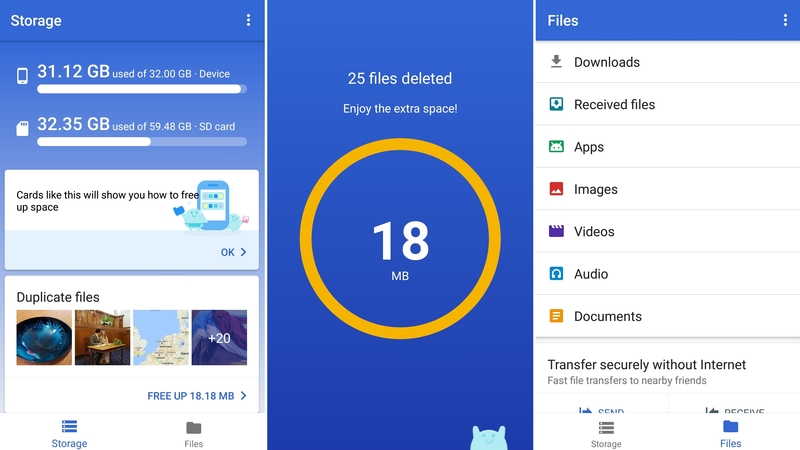 Chances are you already have some kind of file manager on your phone, but Files by Google is still worthy of attention, as it’s made by Google and has many rivals beat. There’s two parts to it. First, the ‘Storage’ section which highlights all the ways you might be able to clear space on your device, such as by deleting duplicate or large files, moving files to your SD card and deleting rarely used apps. Then there’s the ‘Files’ section, which is a file explorer, letting you dive into the folders on your phone so you can find, open, rename, delete or share specific files. The whole app is colorful and easy to navigate as well, with an interface seemingly inspired by Google Now’s cards. 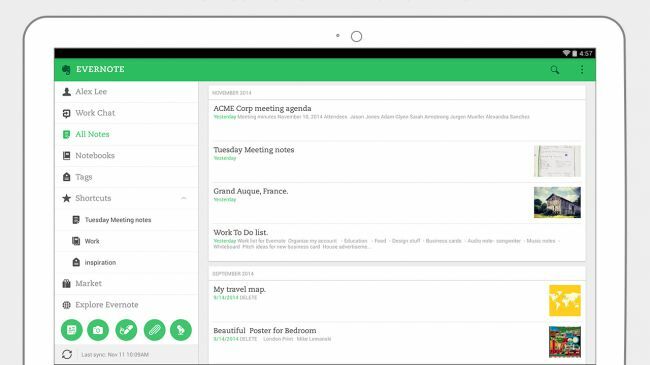 Evernote is an excellent app for your Android device that lets you stash and sync all your text notes, voice memos and files on your phone and access them through a desktop computer. It's a brilliant productivity tool that lets you organize and search your notes so you always have exactly what you need at your fingertips. The paid premium version unlocks offline access and use on an unlimited number of devices, among other things, but for free you still get a vast, feature-packed digitial notebook that's easy to navigate. Our favorite free Android apps for improving productivity, whether through to-do lists, focus timers or other tools. If you ever have trouble remembering people’s birthdays then Wishlist is for you, as it lets you create a list of important dates for the people you care about. Other apps do this too, but with Wishlist you can set a notification to go off in advance of the date, so you have warning that it’s coming up. That too can be handled by some other apps, but Wishlist does it automatically. Just set how many days before a date you want a notification and that setting will be applied to all dates in the app. Ideally, we’d like to be able to set multiple notifications – one in advance and one on the date, for example, but this is a good start. Wishlist isn’t just for dates, either. 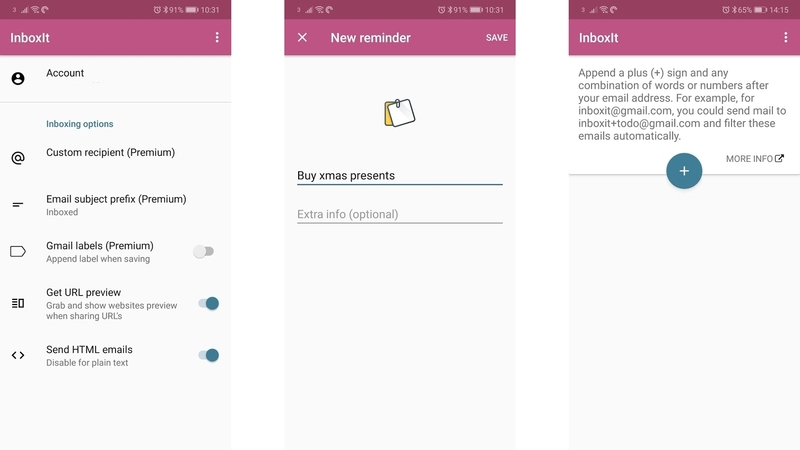 As the name suggests, it can also be used to build up lists - in this case of present ideas for people - so each contact saved to Wishlist can have their own list of potential presents. That means if you ever see something that you think someone might like, you won’t have to buy it months in advance of their birthday or hope you remember it, you can just add it to a list. There are fields for not just the name of a gift idea, but also website links, the price, any notes, an image, and a priority rating out of 10. Beyond all that you can also add a phone number to any contact you add to Wishlist and can then message or call them from the app. The idea is presumably for Wishlist to become your main dialer app, though we’re not convinced you’ll want to make that change right now as the interface is quite bare bones. But for its date and list features it could make a good companion to your existing apps. InboxIt doesn’t try to do everything. Rather, the app does one thing, but does it very well. That one thing is emailing things to yourself, be it photos, videos, URLs or text. You might not think that you need a separate app to send yourself an email, but InboxIt speeds up the process. Once you’ve set the app up you simply tap the ‘Share’ icon on the content you want to send, then select InboxIt and the content will automatically be emailed to you. No need to select an email address, type out a subject or anything else. And if you’re in the habit of emailing yourself reminders, you can do that from InboxIt too. Just launch the app, select ‘New reminder’, type one out and hit ‘Save’. You can set the free version of InboxIt to send things to a Gmail address, which will probably suit most people just fine. But if you want to use a different email you can pay $0.99/£0.99 to unlock premium features, which also include the ability to use Gmail labels and a custom email subject prefix. If you’re anything like us then you probably open Facebook or Twitter about 600 times a day on your phone, even when you know nothing has changed and that you should be doing something far more important. But if you’re anything like us then you’re also motivated by rewards, and Hold gives you them for not using your phone. Simply activate it and put your phone down, and you’ll receive 10 points for every 20 minutes that you resist the lure of your apps and messages. These points can then be exchanged for rewards. These change over time and depend on what country you’re in, but examples include free popcorn at the cinema and free contact lenses. You don’t have to bank very many points for some of the rewards either, with many being available for as little as 20 points. And if free and discounted stuff isn’t enough incentive to stay off your phone, how about a little friendly competition? You can link up with your pals in the app and compete to get the most points. 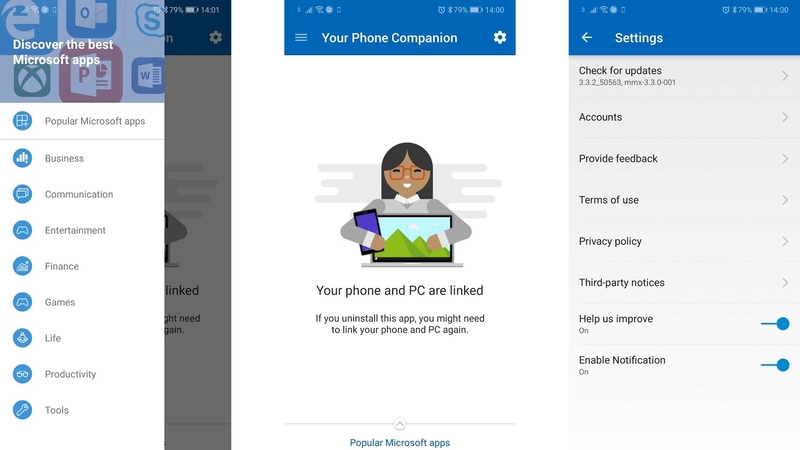 Your Phone Companion is a companion app for a PC app called – you guessed it – Your Phone. The companion app itself doesn’t do much, other than allowing the main desktop app to do its job of showing your phone’s photos and SMS messages on your Windows 10 PC. Both can be browsed, photos can be downloaded, and messages can even be sent and received on your desktop, so you don’t have to keep turning back to your phone. While that’s ‘all’ the app does, those two features could be very useful for anyone who spends a lot of time at their computer, or who tends to email themselves photos to get them onto their PC. It’s worth noting that Google Photos does the photo part too, and is better at it, since it’s a full-featured gallery app, but this is a good alternative for anyone not already using that. Onedox describes itself as a digital P.A. for your household bills, and that’s fairly accurate. 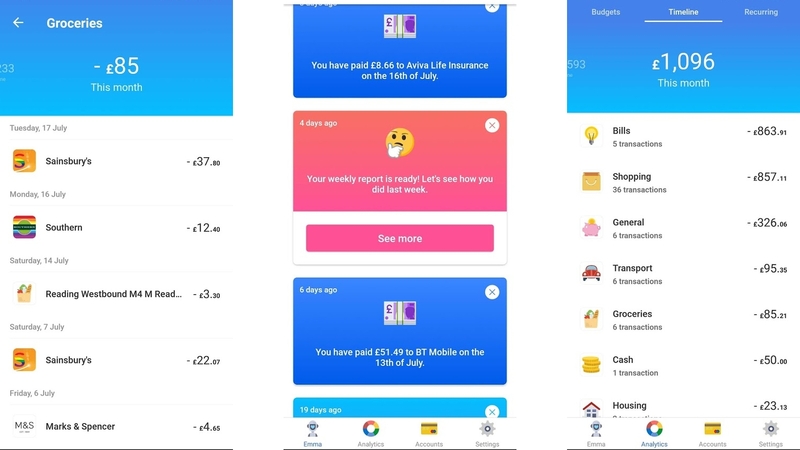 The app lets you link accounts for your household bills, such as gas, electricity, internet, Netflix, Spotify and more, then shows you details of each billing, all on one screen. The app also shows you renewal dates – so you’ll know when prices might be changing and when you can shop around for a new deal. Tapping on any account will show additional details, such as previous bills, price changes, and any notes you’ve added to the account. It makes staying on top of your bills a lot easier and ensures you can always have a clear idea of exactly how much you’re spending. The only downside – other than the fact that this is UK-only right now – is that not all accounts are supported. For example, some gas companies can’t currently be added. However, Onedox is adding new companies and categories of bill all the time, so one day you really will be able to manage all your bills from one screen. Right now you’ll have to make do with managing most of them, which is still pretty handy. Datally is probably not one of Google’s best-known apps, but it deserves to be, especially if you have any interest in monitoring or conserving your data. 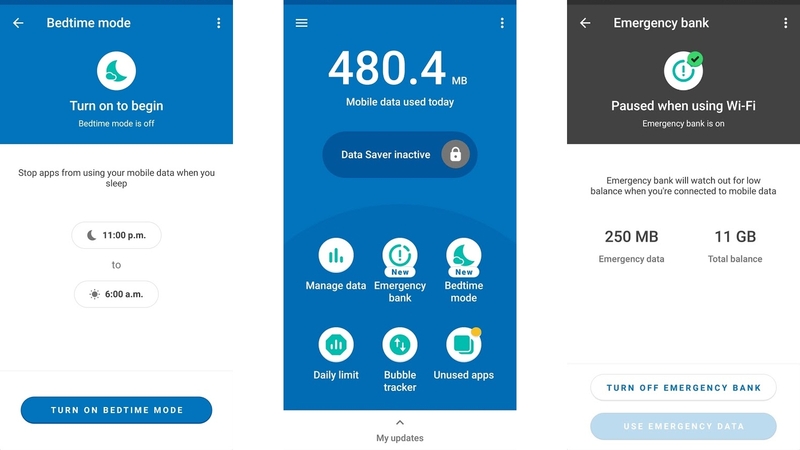 The app lets you see how much data you’ve used in the last day, week or month, as well as telling you which apps are using the most data. It also has some clever extra features, two of which were added recently – so even if you’ve used Datally before it could be worth revisiting. There’s ‘Bedtime mode’, which disables data on your phone between two times that you set, which means that apps won’t be using data in the background while you sleep. Futhermore, ‘Emergency bank’ lets you set aside a portion of your monthly data allowance for emergencies. You decide how much and Datally will make sure you don’t use it accidentally. 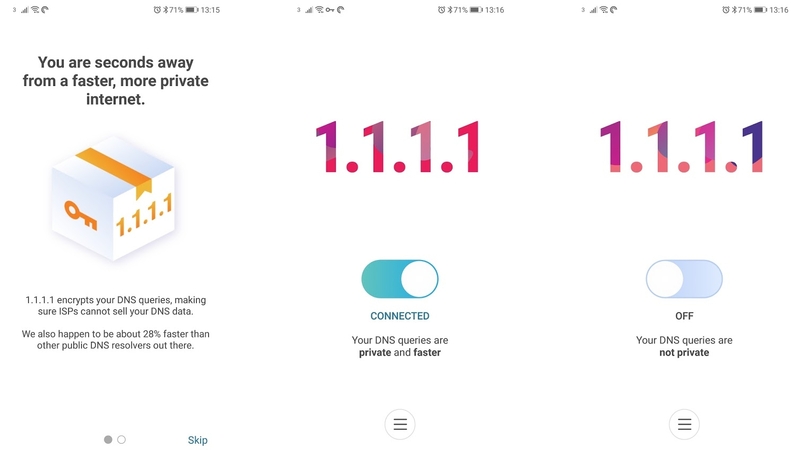 These join existing features such as the data saver mode, which blocks apps of your choice from using data when you’re not connected to Wi-Fi, plus you can view a list of nearby Wi-Fi networks, including information on whether you need a password for them. If you ever find yourself running low on data, then Datally is the app for you. Inware does one thing and does it well: it tells you about the device you’re running the app on. More specifically, it tells you just about every hardware detail, from the screen size and resolution, chipset, RAM amount and battery size, to far more in depth information, like the current speed each core is running at and the serial number. 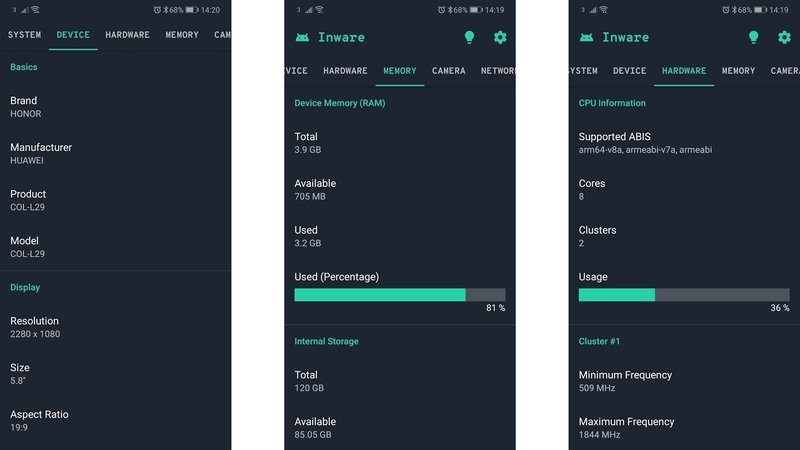 Inware can also tell you how much RAM is currently in use, how healthy the battery is, how hot the battery is, how much storage there is in total and in use, the build number, what security patch your device has, what GPU it has, the aspect ratio of the screen and plenty more besides. It goes way more in depth than your phone’s settings screen likely will, so if you’re ever curious about an aspect of your handset’s hardware or software, this is the app for you. Visual impairments are one of many things that technology has made slightly easier to live with, and Envision AI is a prime example of how tech can help. Point your phone’s camera at whatever’s in front of you, press a button, and the AI will examine it and say out loud what it thinks it’s seeing. Descriptions can be moderately detailed, taking in multiple objects in a scene (for example a computer monitor and the desk it’s sat on). With common objects it all seems quite accurate, though testing it on more unusual things, such as a wooden sculpture of an elephant, led to more mixed results. As well as scenes, Envision AI can also read out text, even if it’s handwritten (though unclear handwriting will again lead to mixed results). So it’s not perfect, but Envision AI could make a big difference to anyone who struggles to see or read on their own. Emma helps you keep a close eye on your money. Link all your bank accounts (including credit cards) and you’ll be able to see all their balances in one place. But that’s just the beginning. Emma also tells you how much money you have in total across all your accounts, as well as how much debt you have, and how much money you gain or lose in total each month. It also lists all transactions and has a good stab at putting them into categories, such as shopping, transport or bills. This also means you can see at a glance how much you’re spending in each category, which is a good way to make you more aware of your spending and potentially reduce it. You can change any miscategorized spends, see a list of recurring payments, get a weekly breakdown of spending and income, and more. Of course, Emma is secure too. It uses SSL 256-bit encryption, supports fingerprint locking and doesn’t store your banking credentials. 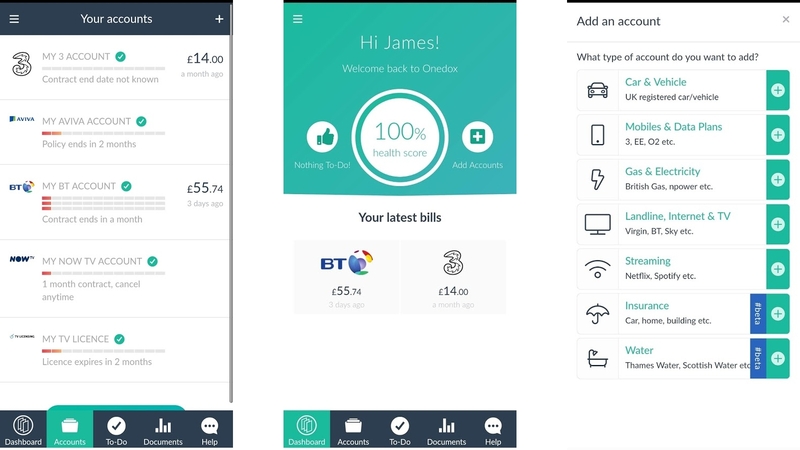 Emma is an essential app if you have accounts with more than one bank, but even if you don’t, chances are that it gives you a lot more insight into your money than your bank does. The only real downside is that it’s UK-only. Starling Bank is more than just an app. In fact, it’s a bank account, but it’s a modern one that’s entirely app-based. That means there are no branches and there’s no web access. That could sound daunting, if the prospect of changing bank account isn’t already off-putting enough, but in fact having everything in an app keeps things simple, and there are some powerful tools here not offered by most conventional banks. For example, it has zero ATM withdrawal fees or transaction fees when using your card abroad, it lets you temporarily or permanently lock your card in-app, and you can enable or disable contactless payments, ATM withdrawals and online payments, for extra security. You can also send in-app requests to friends and family who owe you money (and who don’t need Starling themselves to pay you back), receive instant notifications for income and outgoings, and a whole lot more. As for changing your bank to take advantage of all this, well, you don’t necessarily have to. 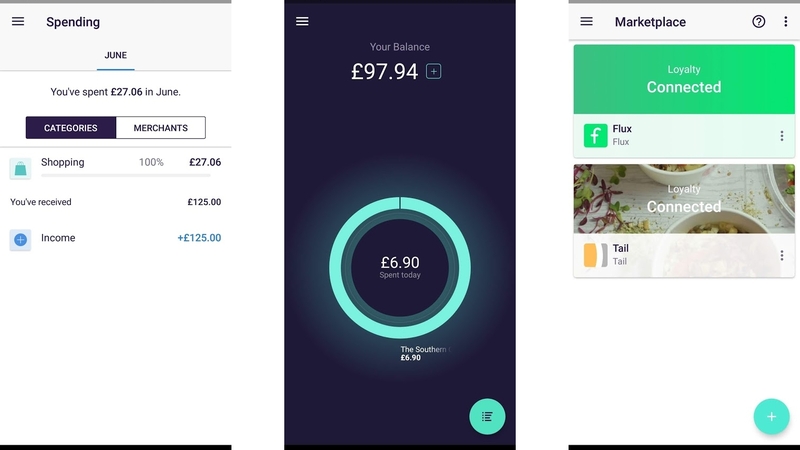 After all, there’s no real downside to having two bank accounts, but if you do decide you want to go all-in with Starling Bank that’s simple too, as there’s an account switching service that does all the hard work for you. This one’s for UK users only, but there are similar app-based banks elsewhere, such as Simple in the US. 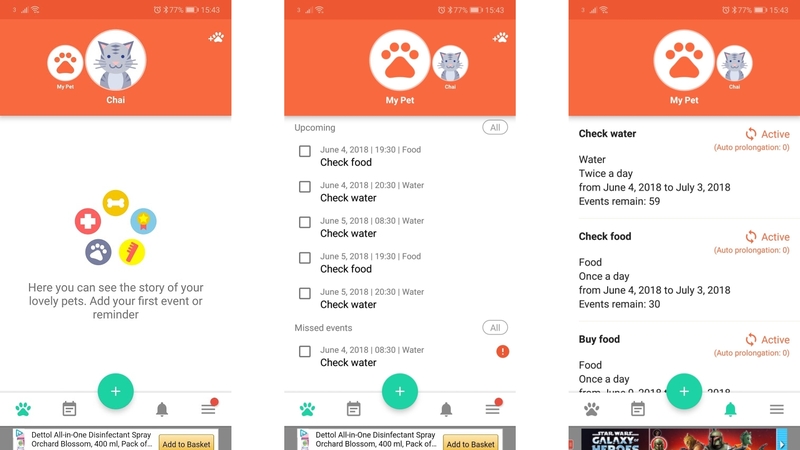 Pet Care Diary is a fairly simple but potentially very useful app for keeping track of when your pet needs feeding, cleaning, walking or whatever else. Essentially, it’s like a calendar or to-do list, where you can set up events and reminders, but they’re all focused on your pet, and if you have more than one pet you can set up individual profiles for each, where you can see every upcoming event and reminder, as well as previous ones. You can also add comments to each reminder, as well as assigning a category, such as ‘food’ or ‘veterinary care’. Pet Care Diary is probably most useful if you have a high-maintenance pet or multiple pets with their own schedules and needs, but if you ever find yourself putting pet-related things in your calendar, or forgetting to do them, then it’s definitely worth having. The core app is free, but for US$2.99/£3.99 you can unlock the pro version, which removes adverts and lets you create an unlimited number of pet profiles, among other things. 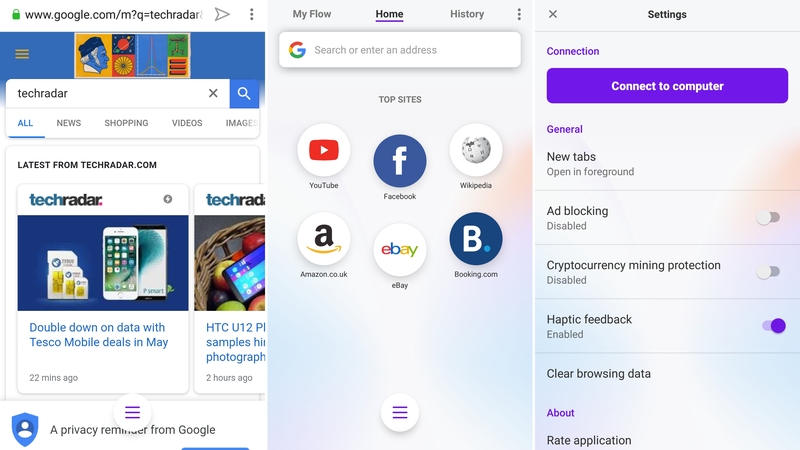 Opera Touch is a browser that’s designed to be used with one hand, with a ‘Fast Action Button’ that’s always visible and easy to reach at the bottom of the screen. Tapping it launches you straight into a web search, where you can type or speak your query. There’s even a barcode scanner here, so you can quickly look items up online without having to type their names. Gesture controls ensure you can navigate the rest of the interface with one hand, letting you switch to recent tabs, reload or close the current page or send it to your computer. That last one is powered by Opera Flow, which lets you share links, videos and the like between your phone and computer with a single tap or click – though of course to enable this you’ll also need to be running Opera on your PC. Opera Touch is also fairly secure, with features such as an ad blocker and even cryptocurrency mining protection, which reduces the risk of malicious sites using your phone to mine cryptocurrency in the background – an act that can drain your battery or even cause your phone to overheat. There are some missing features, most notably private browsing and a desktop mode. Hopefully they’ll be added at some point, but considering Touch’s focus on simplicity, they might not. 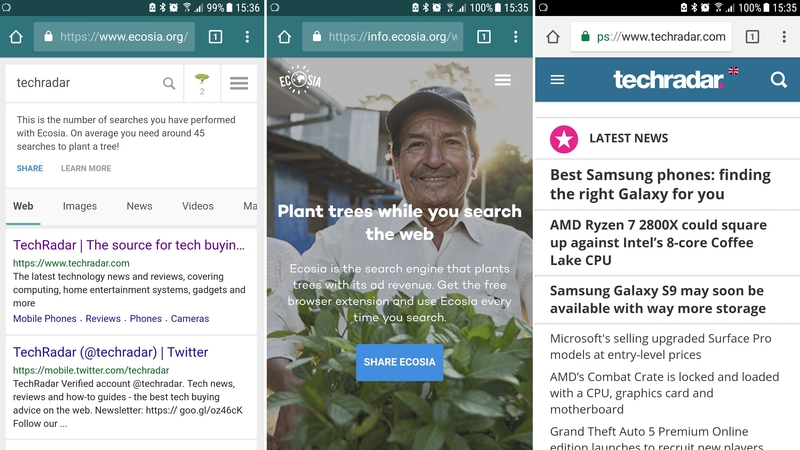 You probably didn’t realize that you can save the world while browsing the net, but you can make a small difference by using Ecosia Browser, which uses its ad revenue to plant trees. Ecosia has already planted over 26 million trees thanks to its users, and for roughly every 45 searches you make another one will be planted. Beyond its environmental credentials, Ecosia is also a very competent browser. It’s based on Chromium so the look and feel is a lot like that of Google Chrome, meaning it’s likely to be familiar to you. It supports tabs, private browsing and bookmarks, lets you view your history, allows autofill of forms and has various privacy controls, so you don’t have to sacrifice a feature-packed browsing experience to help the Earth. Your phone is probably your most used device, so it’s understandable if you get a bit bored of it sometimes and want a change. Rather than buying a whole new handset you could just change your launcher, and Microsoft Launcher is one of the best around. Formerly known as Arrow Launcher, it’s been around for a while and it keeps improving, most recently thanks to the addition of Cortana, which you can activate by tapping an icon or long-pressing the home button. Cortana isn’t any better than Google Assistant (or arguably even as good), but it’s a change and you can still use Google Assistant as well. The rest of the app has a lot to offer, including loads of customizable gesture controls. For example, you can open the app drawer with a two-finger swipe up, but if you’d rather that gesture launched your favorite app, you can set it to do that instead. 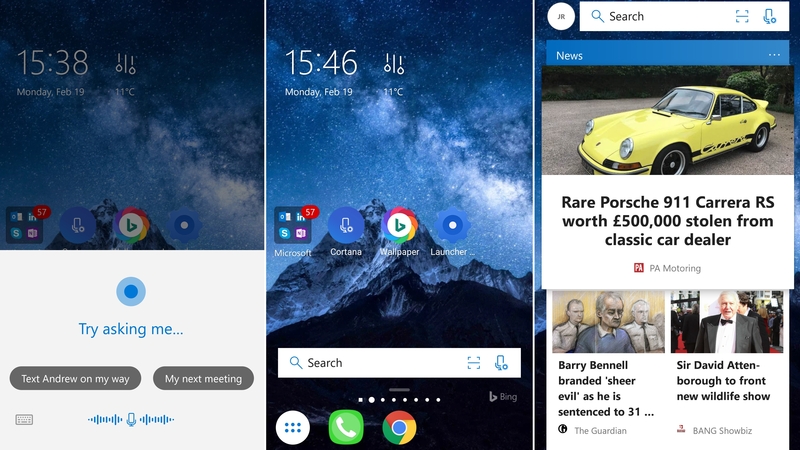 You can also make Microsoft Launcher your own by customizing the theme, icons and accent colors, and if you’re not feeling inspired when it comes to wallpaper then you can set it to automatically change daily. Got your old home screen exactly how you like it? Then when setting up Microsoft Launcher you can choose to import the old layout, bringing all your folders with you. There’s also a clever unified search bar on your home screen that can search both the contents of your phone and the web. For the latter it uses Bing of course, but you can’t have everything. Our favorite free Android apps for customizing and improving the security of your device. There are loads of wallpaper apps, but surprisingly few that will automatically cycle through designs so you can get new wallpapers on your phone without having to lift a finger. And those which do offer that service are often quite limited in terms of content. Not so with RedPapers. This app lets you pull images from any subreddit and have them set as the wallpaper for your home or lock screen. 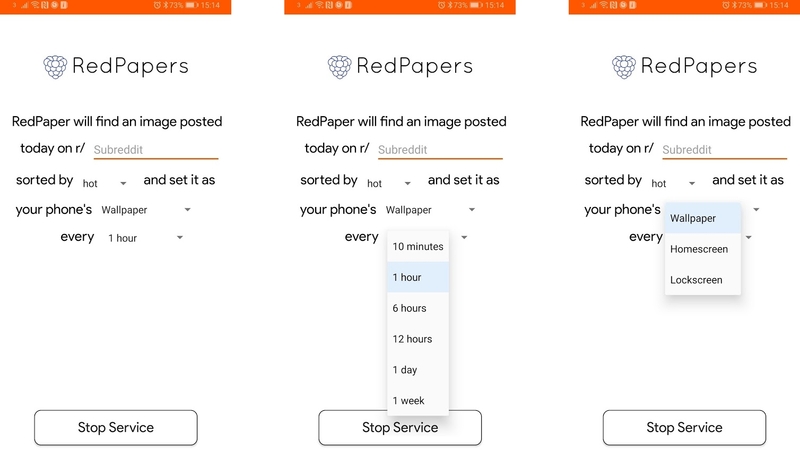 You simply type the subreddit name, pick how often you want the wallpaper to change (with a range of options from every 10 minutes to every 1 week), pick whether to sort the wallpapers by what’s hot or what’s new, and away you go. RedPapers itself is just a single screen where you select those options, so there’s not much to the app, and it’s not much of a looker in itself, but it’s really useful if you get bored of staring at the same wallpaper every day. 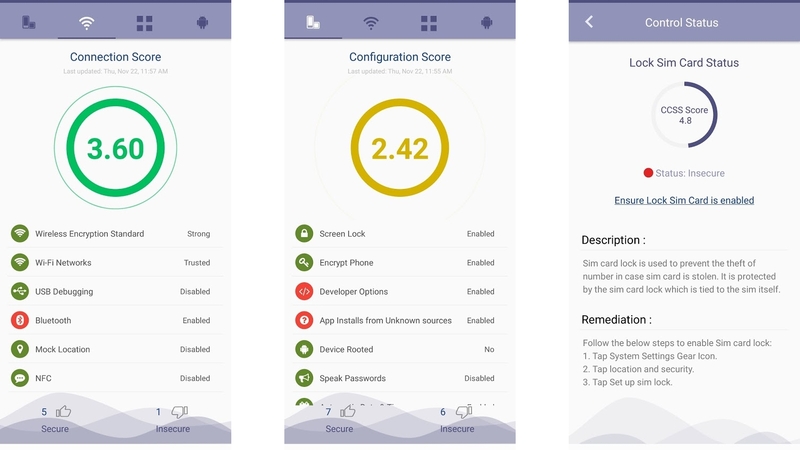 SAFE (which stands for Security Assessment Framework for Everyone) shows you at a glance how secure your Android device is, giving it several scores out of five – one for its configuration settings, one for connectivity, one for applications and one for the operating system. Higher is better and it factors in all kinds of things, including whether your SIM card is locked, to whether you allow installation from unknown sources, and whether you allow notifications to show their content on your lock screen. As well as the overall score for each category you can see a list of all these factors, with ones in red being ones that aren’t secure (in the app developer’s opinion). You can tap on each of these things for more details as well as a guide to making them secure. You probably won’t be aiming for a perfect score, especially as some things that SAFE puts in red will be intentional things that you want or need. For example, it considers location services and Bluetooth to be insecure. Still, it’s a good way to quickly and easily assess the security of your device and tighten it up if you feel the need. SAFE might even end up highlighting some vulnerabilities that you didn’t know about or hadn’t considered, which should be enough to make it worth a download. If you ever use public Wi-Fi networks, then 1.1.1.1: Faster & Safer Internet is for you. That’s because public Wi-Fi is notoriously lacking in privacy and security. There’s a chance the provider will sell your browsing data and it also allows other people – if they have the skills – to snoop on your browsing data. But 1.1.1.1 helps stop either of those things from happening by changing your DNS resolver to one managed by Cloudflare (the company that makes this app). It promises never to sell your data or use it to target adverts, and by browsing through Cloudflare you’re also hiding your data from any other potential snoopers. As an added bonus, you might even get a speed boost, as Cloudflare’s DNS resolver is the fastest public one. The app is also completely free and easy to use – there’s just a single toggle to turn 1.1.1.1 on or off. That’s it. There are various Android apps designed to help monitor or control your child’s smartphone use, but now finally one has come from a big name, specifically Google. Google Family Link is actually two apps. 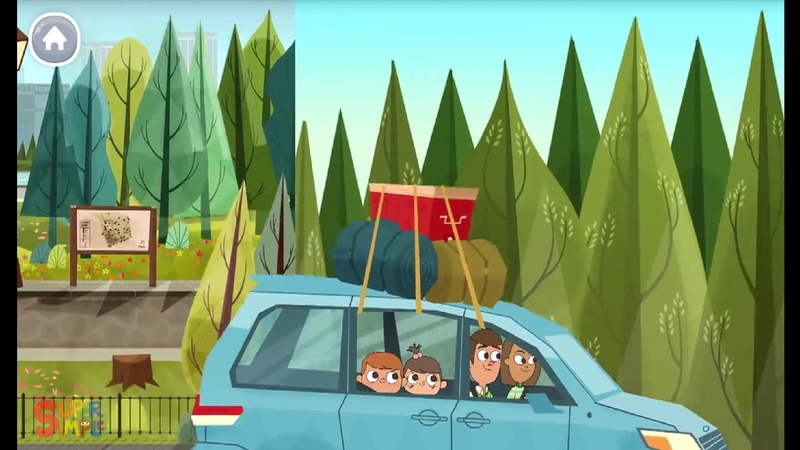 There’s Google Family Link for Parents, which you’d be installing on your device, and Google Family Link for Children and Teenagers, designed to be installed on the devices of family members under 13. Once both are installed and set up, you can use your device to view your child’s smartphone activity, choose which apps to allow, set screen time limits, lock their device, control in-app purchases and locate their device. Google Family Link is a useful set of tools for making sure your child isn’t accessing content they shouldn’t, using their phone when they shouldn’t, or spending money, or it can be used as more of a safety feature to locate them when they’re not with you. It’s also completely free. Privacy is increasingly hard to come by, especially if you live much of your life online, but Signal Private Messenger can at least ensure no one snoops on your messages. The app uses your normal phone number and address book, so as with WhatsApp, you don’t need to set up a separate account or anything, making it convenient to use. 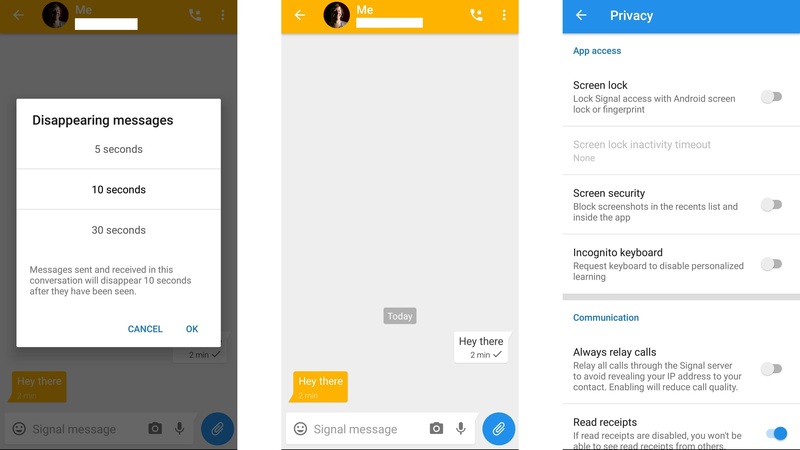 Signal is more secure than WhatsApp or most other messaging apps. Not only does it use advanced end-to-end encryption, but it’s also open source, meaning anyone can audit the code to verify how secure it is. 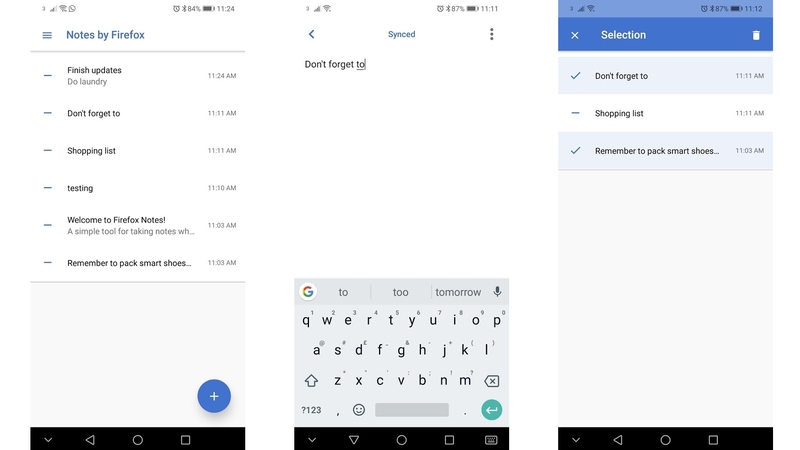 Signal lets you set messages to delete anywhere from five seconds to one week after they’ve been seen – or you can have them remain forever if you’d prefer. 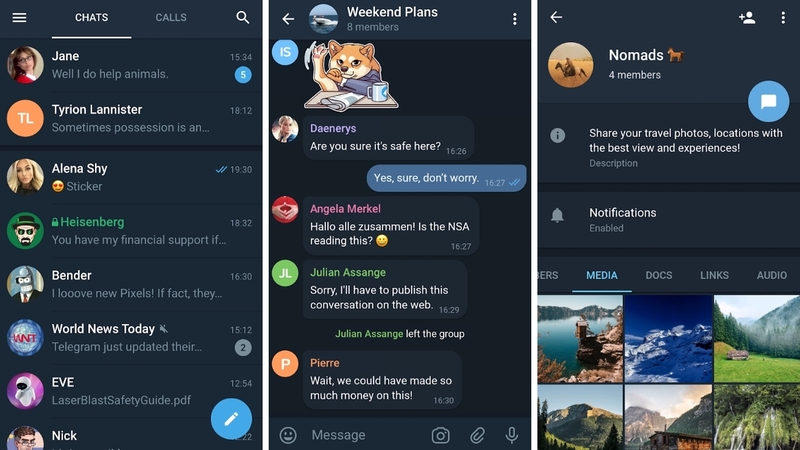 The app also promises that its server never has access to your messages or any other data, plus it offers password or fingerprint protection and it’s not light on general messaging features, as it also supports group chats, voice calls and attachments. In all, it’s a decent enough messaging app that it could be a strong choice even if privacy and security are only of secondary concern. 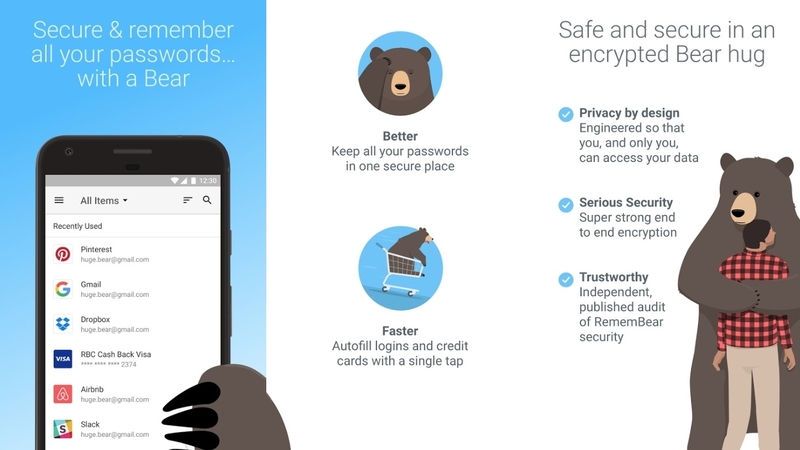 RememBear is a simple, surprisingly cute password manager full of bears. Simply add all your passwords to it, lock them behind a master password or fingerprint, and RememBear can auto-fill login forms with them so you never have to remember them or type them again. RememBear can also generate new secure passwords, so you won’t have to think them up, and the data is synced across devices, so if you don’t have your phone to hand you can access your logins from a computer or other device. You can also store credit card details, there’s end-to-end encryption and there’s a built-in browser for secure web browsing. RememBear lacks some features offered by rivals like LastPass, such as favorites, but more features are likely to be added over time. It’s also free to use on a single device, though there’s a paid version that you’ll have to upgrade to for $35.99/£32.49 per year if you want to access your account on multiple devices. Two of the main reasons for using a VPN are accessing geo-restricted content and maintaining your privacy and security online. ProtonVPN can help with both of those, and costs a lot less than most rivals. In fact, the core service is totally free, and there are no bandwidth restrictions, so you can use it as much as you want. There are no ads either, because it’s fully funded by optional paid subscriptions (starting at around $5/£3.50 per month). 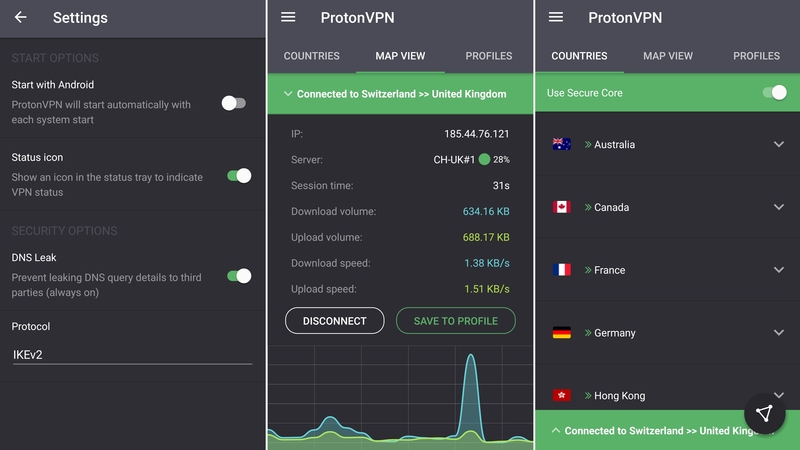 These unlock higher speeds, VPN servers in more countries and the ability to use ProtonVPN on more than one device. But for free you still get access to VPNs in three countries, and a whole lot more security than you’ll have without a VPN, as your activity will be encrypted and protected by Swiss privacy laws, and it won’t be logged. Almost unavoidably there will be times when you have to hand your phone to someone else, be it to show them some pictures or let them make a call, but what you probably don’t want is the risk of them rummaging through your other apps. Or, equally, you might not be in the habit of handing out your phone, and not really want to have to unlock it every time you use it either, but still want security for your most sensitive apps. Either way, Norton App Lock can help, by, well, locking the apps of your choice, behind a PIN, pattern or fingerprint scan. The app itself is easy to use – just set up the security options you want, then tap the padlock next to any app you want to lock. 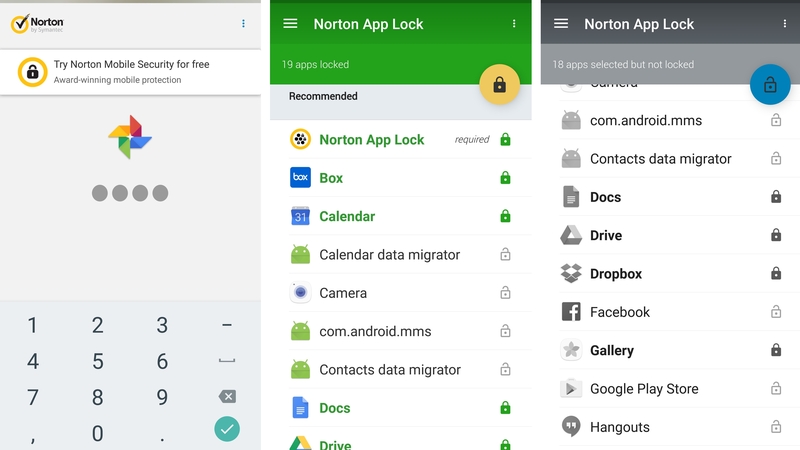 Once done, you’ll get Norton’s lock screen whenever you (or anyone else) tries to launch the app. 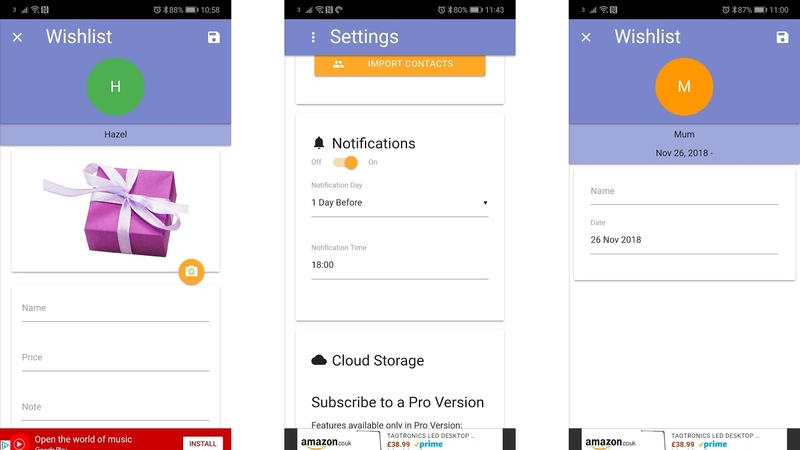 While Norton App Lock isn’t the only option for this it is the best we’ve come across, as it’s fast, loading the instant you tap on a secured app, rather than keeping you waiting. It’s also smart enough not to re-lock an app until you turn the screen off, and it has other handy features too, like one-tap locking of all the apps it thinks you should be securing. Our favorite free Android apps for planning a holiday, checking the weather and getting around without getting lost. There are all sorts of apps designed for journaling your travels, but Polarsteps can do much of the work automatically. 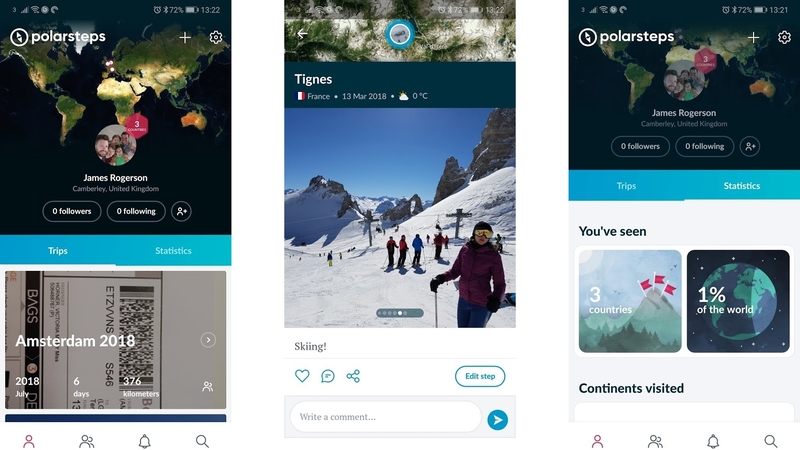 The app will track where you’ve been and add photos from your travels, giving you a map and gallery of all your trips, simply by having the app running in the background on your phone. You can make trips manually and add any photos it missed, but creating trips automatically means you’ll have at least a partial record of your adventures without doing anything. This might sound like it would hammer your phone’s battery, but in fact Polarsteps is designed to only use around 4% each day and it doesn’t even need to be connected to the internet, which is ideal if you’re traveling somewhere where data costs extra. You can keep your trips private or share them with friends and family, and by following people in the app you can see their journeys as they happen. Polarsteps is also nice to look at, easy to use and completely free, making it near essential for anyone who wants a visual record of their trips. 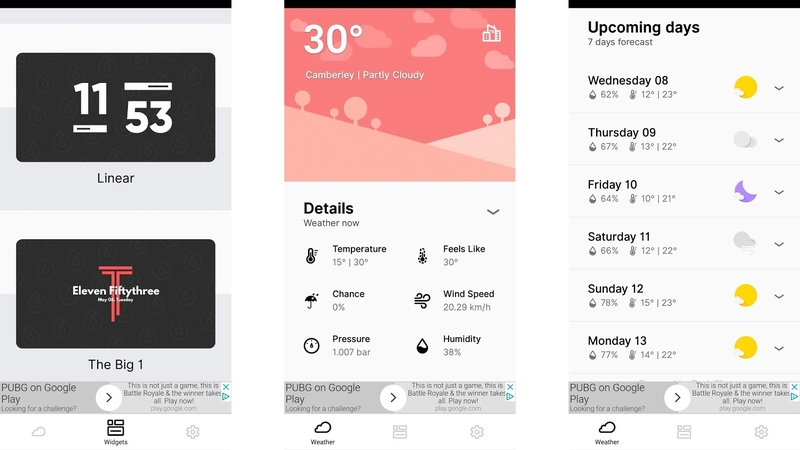 Overdrop is yet another weather app, but it stands out more for its widgets than its forecasting skills. It has quite a lot of them, and many are beautifully designed, showing some combination of the weather, time, day, date and battery level. We’d be surprised if you can’t find one you like, and while some are reserved for the paid Overdrop Pro app, many are free. Beyond that, Overdrop is a perfectly accomplished weather app, with seven-day forecasts, nice animated illustrations, and information on things like cloud cover and humidity. There’s a lot more to the weather than you’ll generally see in a typical forecast, and it can be a lot more interesting – and beautiful – than a simple temperature reading. Ventusky knows this, as it makes forecasts more engaging by including an attractive weather map and wind animation, complete with the current temperature shown on the map, so you can see exactly which areas are what temperature at a glance. 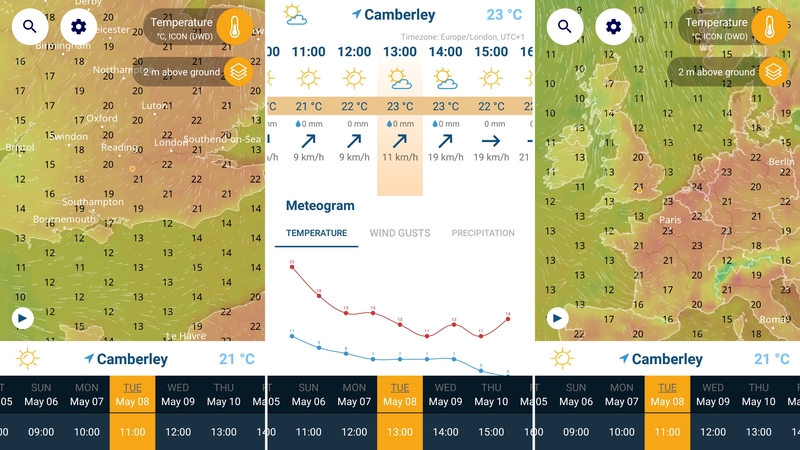 Hourly forecasts let you see how the weather will change over the day and tapping on any hour or day will adjust the weather map accordingly. You can also view weekly charts of the temperature, precipitation and wind, so you can see how much it varies over time. Sunrise and sunset times are also available, so there’s a lot to sink your teeth into, but really Ventusky is all about that weather map and wind animation, which shows the motion and direction of the wind in a mesmerizing way. Facebook Local is all about finding events and attractions nearby. It links to your Facebook account then shows a bunch of events listed on Facebook that are near your current or home location, or another place of your choice. Some of these will be from friends and pages that you follow, but it will also dig up other local public events, so you’re likely to discover things that you wouldn’t have found on your main Facebook feed. 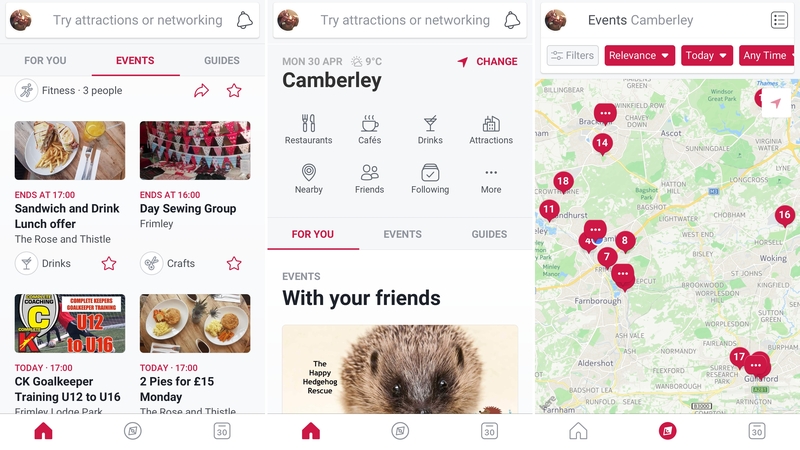 You can filter events and attraction by type, date, location or time, view them on a map and add them to your Facebook calendar, so it’s simple to control what you see and keep track of what you’re interested in. You can also add your phone calendar to the app, so you can see and manage everything in one place. More or less all of this stuff can be found on Facebook itself, but Facebook Local is a much more focused way to find out what’s going on around you, without all of Facebook’s many distractions, so it’s worth having on your phone even if you already have the main Facebook app. Moovit is the only app you need to navigate public transport wherever you might be in the world. Simply enter a destination and it will tell you how to get there from your current location (or you can set a different start point). Moovit will give you various route options using different forms of transport by default, but you can tell it to only include certain kinds of public transport, or to minimize walking or transfers. Select a route to see full step by step instructions or get live navigation. The app will tell you exactly where to go and even alert you when you’re nearing your stop so you don’t need to stare at your phone screen the entire journey. There are also timetables for buses and trains and you can save your favorite destinations or transit lines to quickly get directions and timetables in future. Moovit also has widgets, offline maps, and transport information for thousands of cities in over 80 countries. We weren’t kidding when we said it’s the only public transport app you’ll need. Trips by Lonely Planet is a visually beautiful way to share your travel experiences or view those shared by others. It’s essentially a journaling app designed for globetrotters. 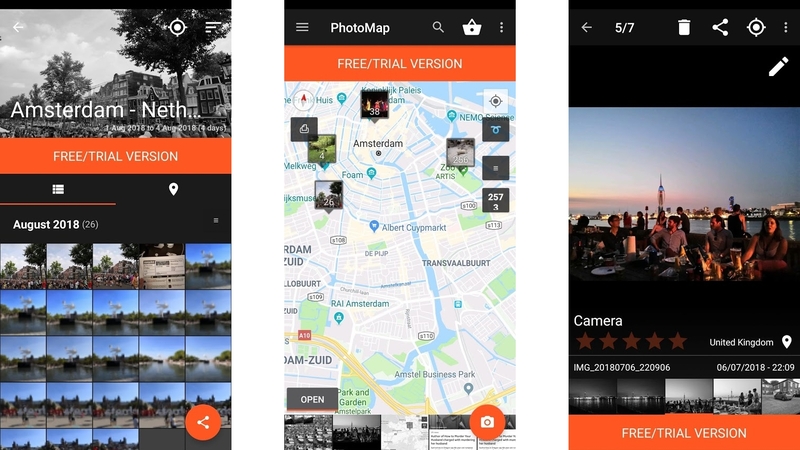 Create a new trip in the app, give it a title, subtitle and cover photo, then add your choice of photos, text and maps. Your trips can be kept private or shared publicly, you can edit them after posting, and of course you can view and favorite other people’s. 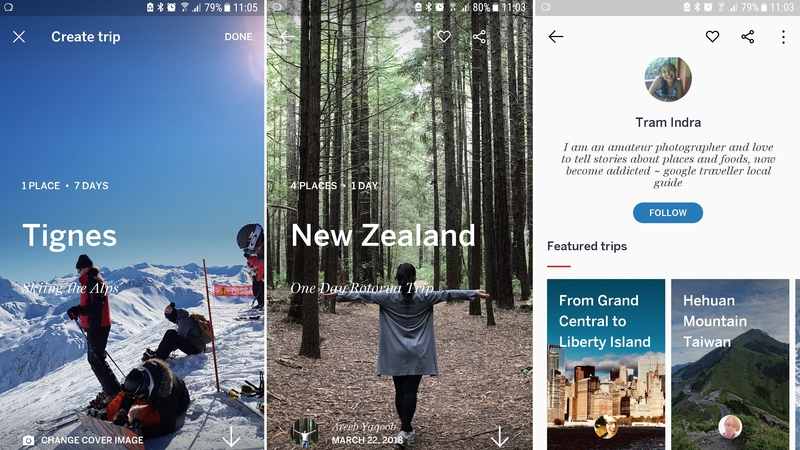 There’s a slight social element in that you can follow other users, so you’ll always see any new trips they post, but mostly this is just about seeing the world from your phone and sharing your own trips with the world. While there’s still something to be said for keeping a paper journal, going digital gives you a lot more convenience, security and features, and Day One Journal is one of the best tools for the job. 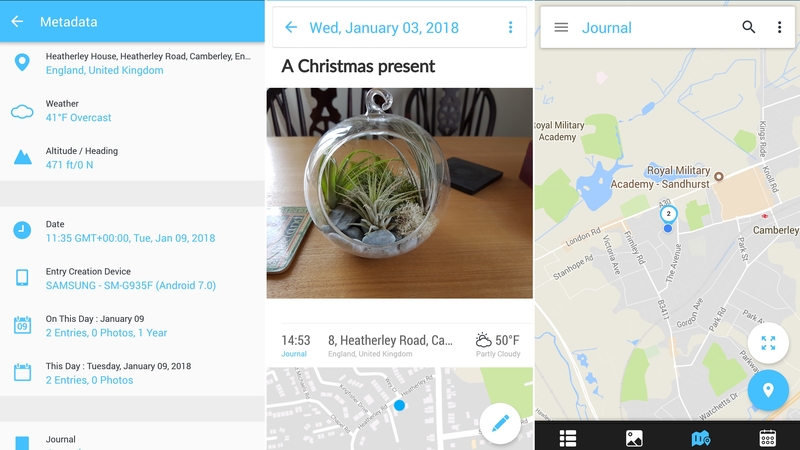 Having enjoyed years of popularity on iOS, it’s finally arrived on Android, bringing with it a slick interface that lets you see your journal entries by date, as a gallery of attached images, or on a map of the world with pins that take you to an entry made at each location. Making a new entry is as simple as tapping the big plus or camera icons on the main screen, depending on whether you want to start with a photo or text. Day One Journal adds the time and current weather to each entry automatically. You can also set reminders to help you get into the journaling habit, star your favorite journal entries to easily return to them, add tags, and get alerts for entries you made on this day in previous years, or at nearby locations. With optional fingerprint or passcode security, no unauthorized eyes will be able to access your memories. That’s all free, but there’s also an optional $24.99/£22.49 yearly subscription that lets you back everything up to the cloud, access your journal on multiple devices, keep multiple journals and more. It’s not cheap, but could be worthwhile if you get really into journaling. Arriving in a brand new city is always exciting but it can also be a little daunting, especially if you need to get around using public transport. 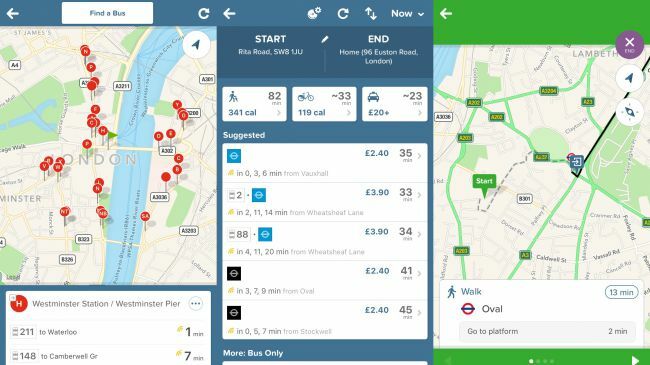 Citymapper is a brilliant app that brings you real-time information on public transport for cities around the world. 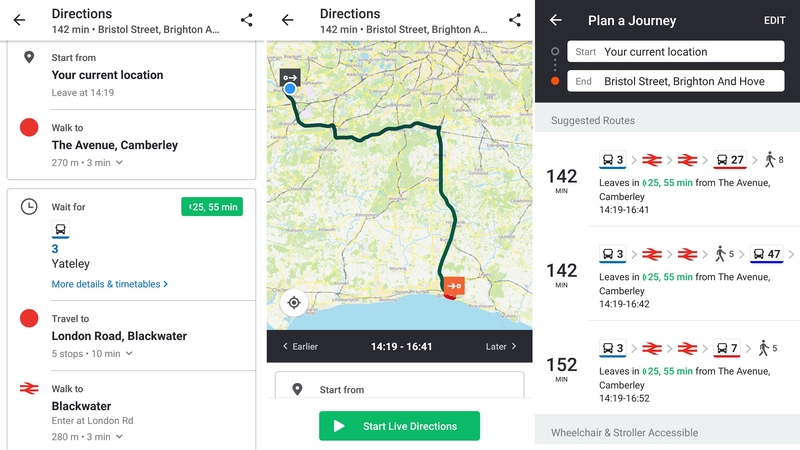 You can easily plan your route using all kinds of transport, from buses to ferries, and you can be kept up to date with real-time data, including any disruptions or cancellations. An essential app for any city-bound traveller.